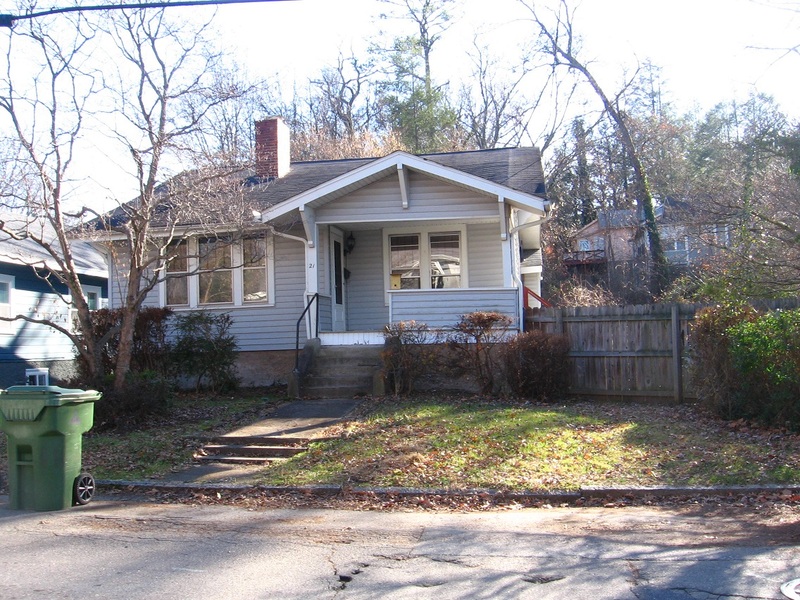 … then moving to *Ashville*. This creek is possibly fairy laden. I will not give out the exact location yet. That’s a fairy bridge if so, and it probably is. Across the road we come to perhaps the former home of George and Harriet and Ingleboort and Flaarph, 4 aliens from the planet Glooton who helped the creek fairies intergrate with the local human population, perhaps. G and H assumed human form, while I and F took the form of the fairies. Interesting. We’ll get back to them soon enough. 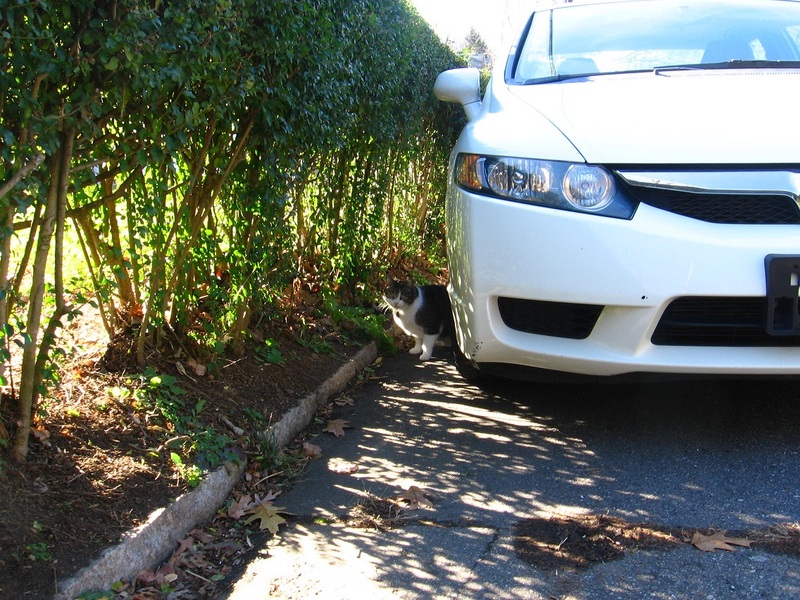 A cat on the same street who may have been trying to tell me about the fairies and how I’m on the right track. Gotta learn that universal cat language sometime I’ve heard about. Old rusty bike in a tree I also spotted in a Google map streetview capture from May 2012. Colors of TILE 01, on a particular Ashville residential road I’ll call Lime Street. Colors of TILE 02 on Lime Street. Chilly Frosty w/ armless Homer Simpson in background. Lime Street again. Street off Lime Street: angel. George and Harriet and Ingleboort and Flaarph. House after they left, returned to pre-contact status. Goodbye and happy star trekking G, H, I, and F! Ingleboort and Flaarph detail. Happy landings! 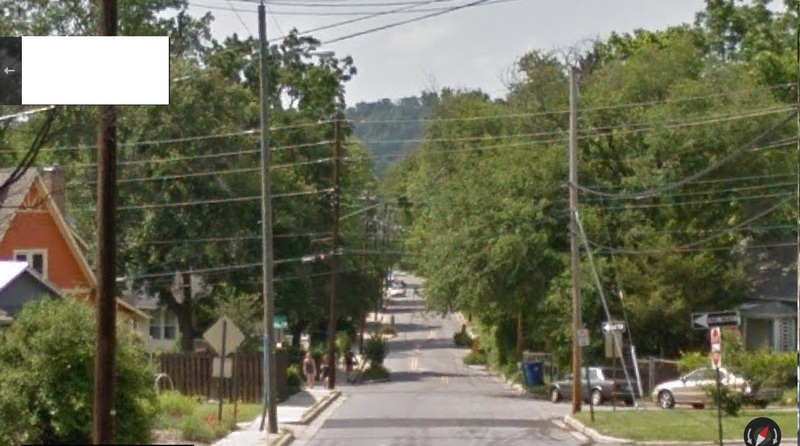 I wanted to leave a placeholder post for a description of my visit to Dead Center Hill again near Woodrow Wilson College. Unfortunately my camera batteries went dead on me during the visit. A big part of the news is that someone (some*thing*?) 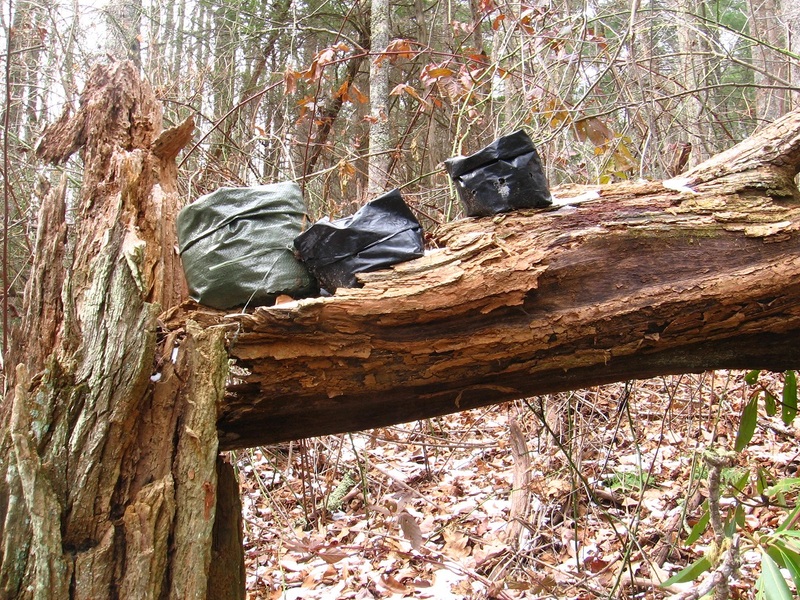 has been working on a small lean-to on top of the hill since my last visit. The bit of old kane found then has been employed in the construction. 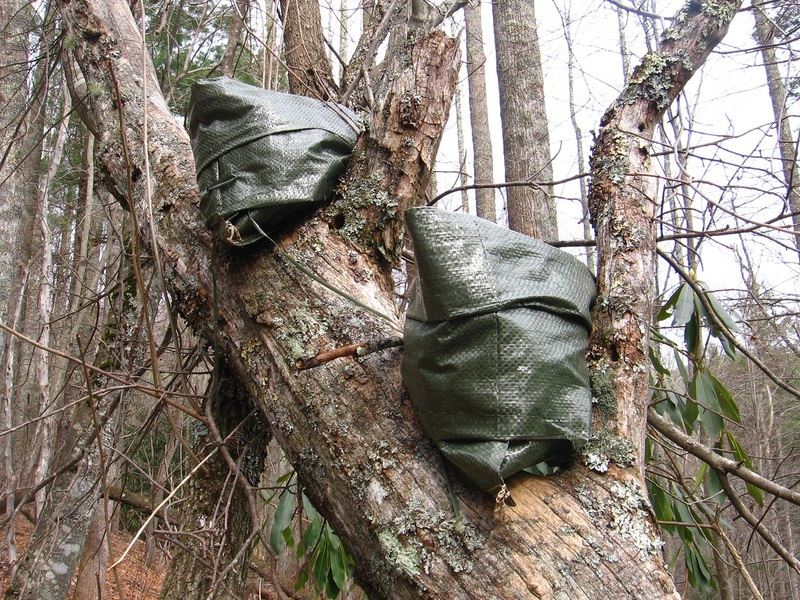 A piece of tarp could cover it and provide a small shelter. But *has* it been used as such? And if so, was *Warren* (again separated from Wilson) the dweller? A second bit of news is that the flat area around Arch Rock seems more meaningful now that the weeds have died off, centered around a penninsular area between two small stream flows. I though this place might be a good spot for a statue of some sort, or a rock cairn or something to mark the spot. We’ll see what develops in the future. Another piece of good news is that I had no problem accessing Dead Center Hill, and didn’t feel like I stood out like a sore thumb and all exposed while walking next to the Wilson River after the protective rows of corn had been harvested. I think it could still be a regular destination when we finally get to Ashville in 6-9 years. Just get rid of the alien angle. The 2 pairs are obviously related. 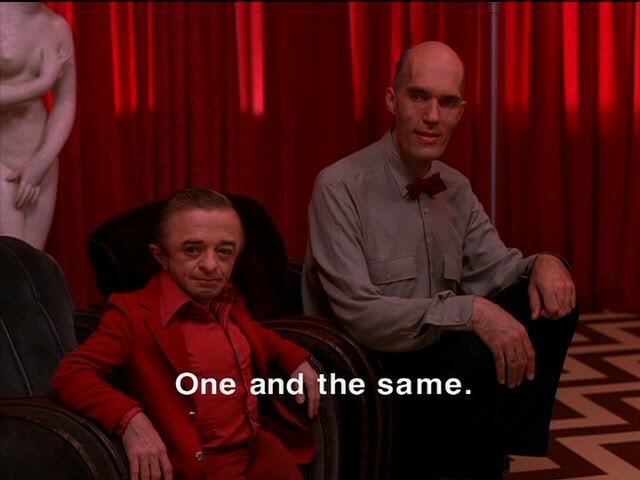 Are they one and the same[ like the Giant and the Dwarf of Twin Peaks]? The heads of the humans and the heads of the 2 fairies are the same distance apart. Reverse one or the other and they can be directly overlapped. Must mean something. So this is a place of contact. Place of contact. Same. One. This brings to mind Wild Goose Island as the only island in St. Mary’s Lake of Glacier National Park, and pictured in the opening sequence of The Shining. In 1985 Murdock took over the nearly bankrupt Hawaiian firm Castle & Cooke, which owned pineapple and banana producer Dole Food Company. He developed Castle & Cooke’s real estate portfolio into residential and commercial properties and turned Dole into the world’s largest producer of fruits and vegetables. Acquiring Dole privately in 2003, Murdock completed a $446 million initial public offering in October 2009 and the company traded on the New York Stock Exchange under the ticker DOLE until a private merger agreement was approved October 31, 2013. As a result of his purchase of Castle & Cooke, Murdock acquired ownership of 98% of Lana’i, the sixth largest island in Hawaii. 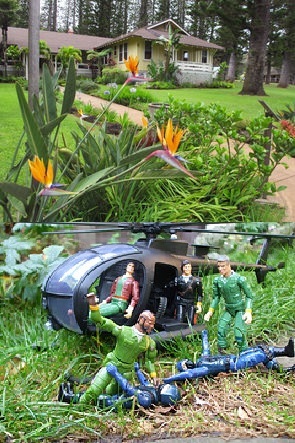 In June 2012, Murdock sold his interest in Lana’i to Larry Ellison. 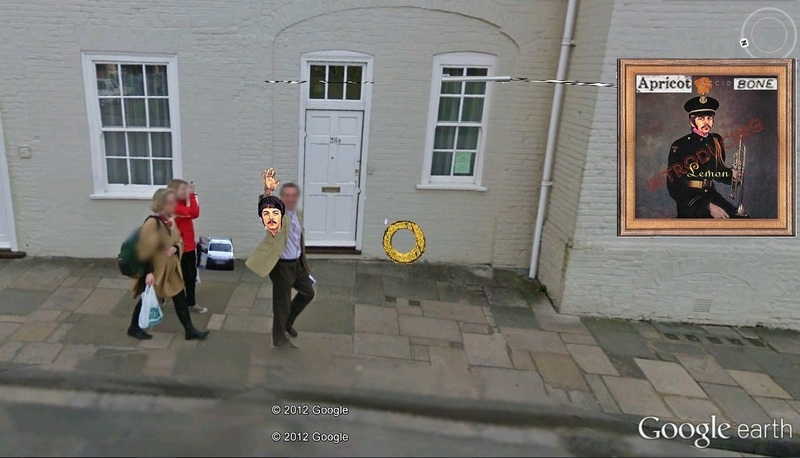 I have discovered another Google Maps template for a 360 degree art event. 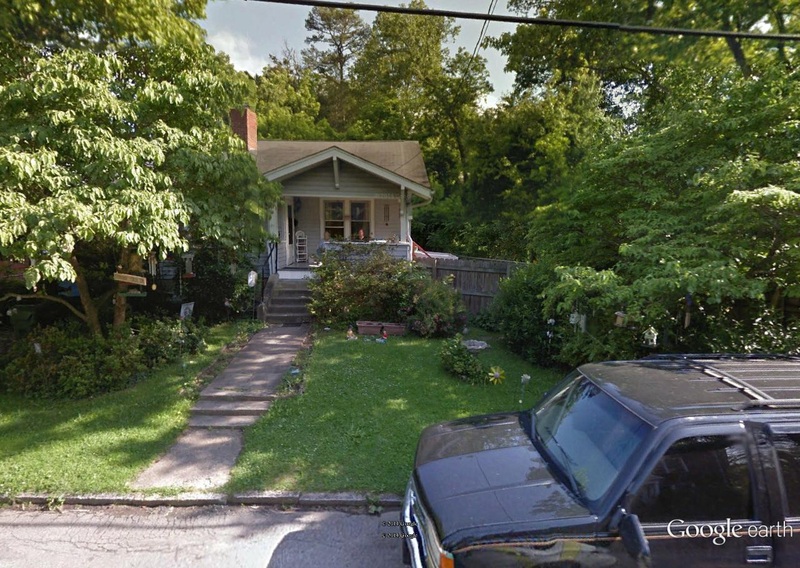 This one, probably not surprisingly, is set in Ashville, our retirement destination. The road is Murdock, but I’m going to call it Lock. 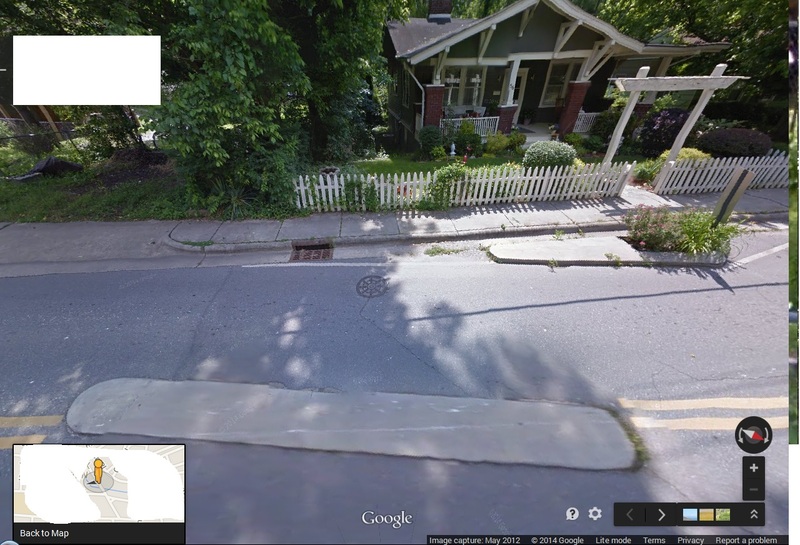 Unlike Lock Ness in the UK, there are not one but a number of (traffic) islands in Lock Street. So is that the right thing to call it? 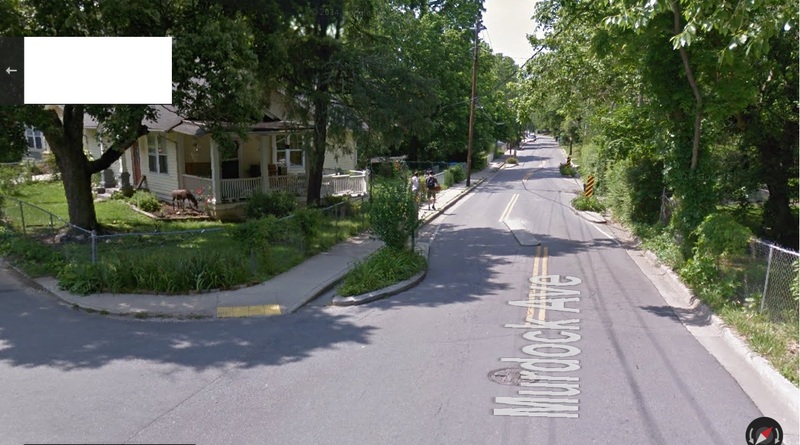 Let’s call it Murdok Street for now. 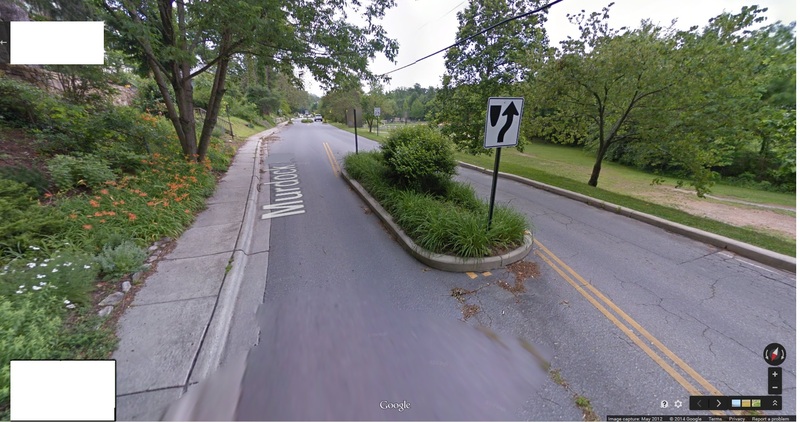 Then there are the newfangled traffic islands and speed bumps and humps. In Redwood Forest and on Murdock Avenue, there are obstructions that look like something you’d find in a pinball machine. These devices, favored by the advocates of exclusion, force drivers to bob and weave and slow down to well below the posted speed limit. In some cases, these calming tools cause side roads to suddenly become one lane, setting the scene for collisions at whatever speed. 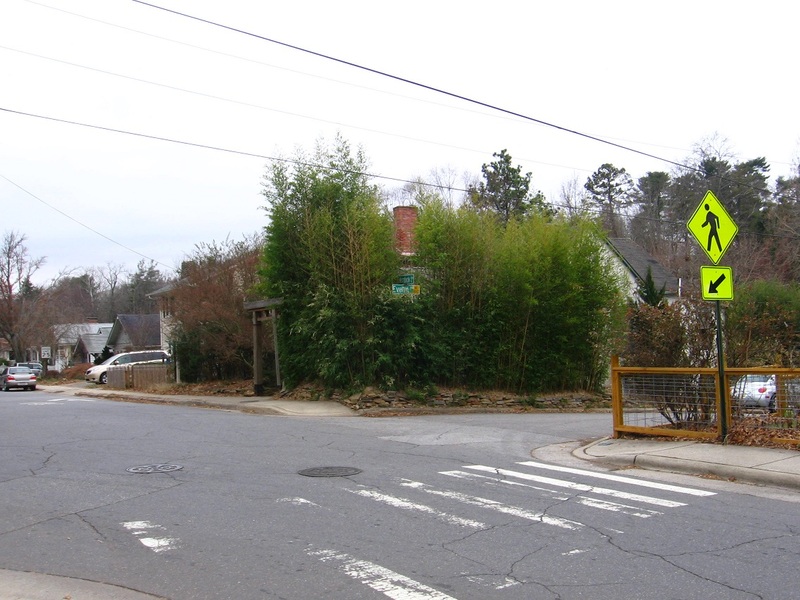 When exploring around Ashville about 2 weeks back, I came across one of these “pinball machine” obstructions, and, yes, it looked quite odd and puzzling. I was also instantly catalyzed by it, in retrospect. 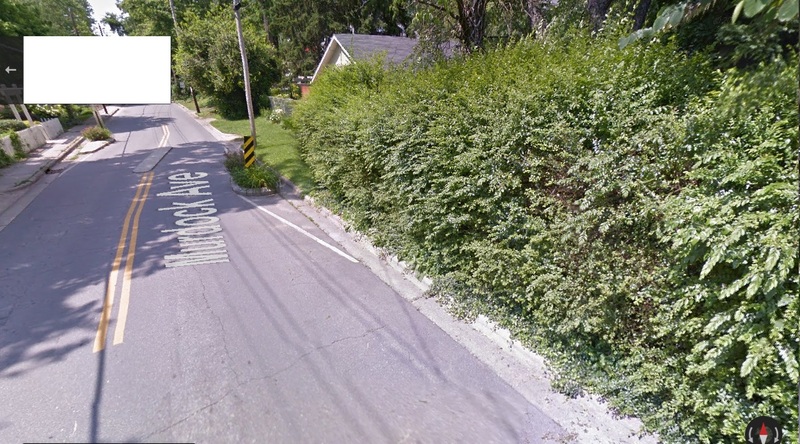 I knew that the two sets of traffic islands near the southern end of the road in question, almost mirror images of each other and set about 50 yards apart perhaps, were somehow important on not merely a traffic control level but also an artistic one. And now through the above linked article I find that these things are perhaps not even a decade old. They were not here during our 3 year stint in Ashville from the early 90’s. So I’ve decided to name the street Ness Cherry, reversing the situation in Scotland. There we have Cherry Island (aka Murdock’s Island) as the lone one in Lock Ness, famous for its sea monster of course. Here we have a Cherry Avenue with several islands, all named Ness I suppose. Think that works. 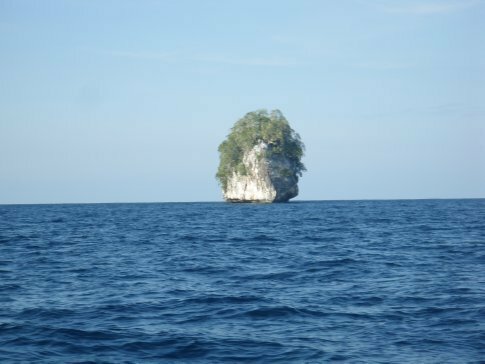 These islands have only come into being in the last 10 years — risen from the (gray, water-like) pavement surface as it were. 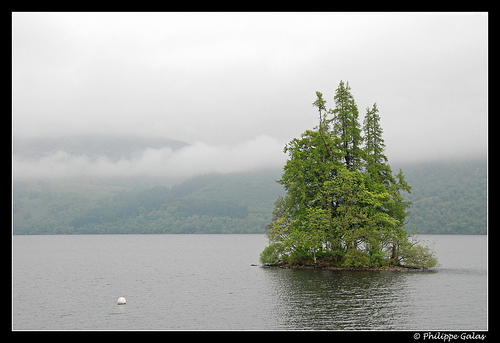 This is similar to Cherry Island in Lock Ness, also artificial in nature. While Cherry Island has risen from the sea, nearby Dog Island, a natural one in contrast, becomes submerged. Ladd initially came to Hollywood in 1970 to begin a career in music (she was known as “Cherie Moor” when she was the singing voice of Melody on Hanna-Barbera’s Josie and the Pussycats animated series). She soon began to land non-singing roles in commercials and episodic television—including guest appearances on shows such as The Rookies, The Partridge Family and Happy Days. The Charlie’s Angels series made her an overnight star, and Ladd took the opportunity of her sudden popularity to further pursue her musical interests, guest-starring in musical-comedy variety series and specials, performing the National Anthem at the Super Bowl XIV in January 1980, and releasing three albums, enjoying a Top 40 Hot 100 single and a Gold record. In September 2000, Ladd starred on Broadway, taking over the title role from Bernadette Peters in a revival of Irving Berlin’s Annie Get Your Gun. She played the role until January 2001, when Reba McEntire took over. … but in moving up Cherry Avenue the pairs become more resolved. 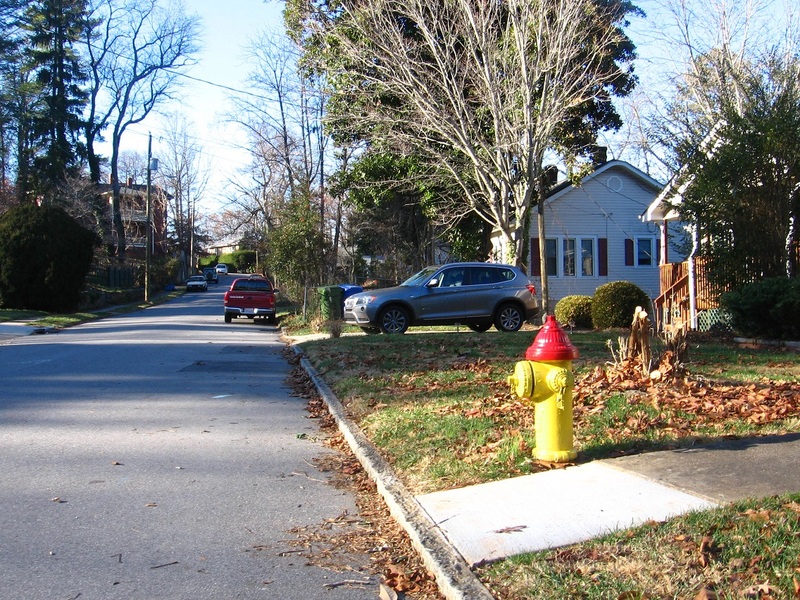 They step up on opposite sides of the same street at the same time. The far couple walks past the first traffic island of the road heading north. We can now see that the foreground couple are 2 girls, perhaps teenagers still. We can also perhaps make out that one of the two pair in the background is holding a basketball. We pull even with the 2 girls. 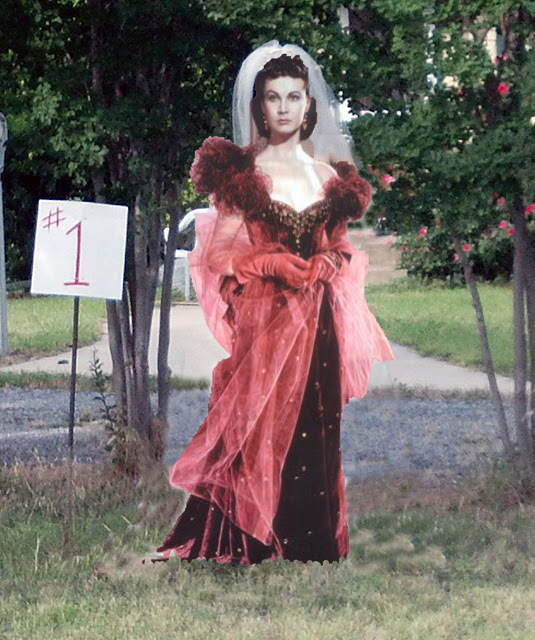 The other couple keeps heading down the street, now just past the first traffic island. 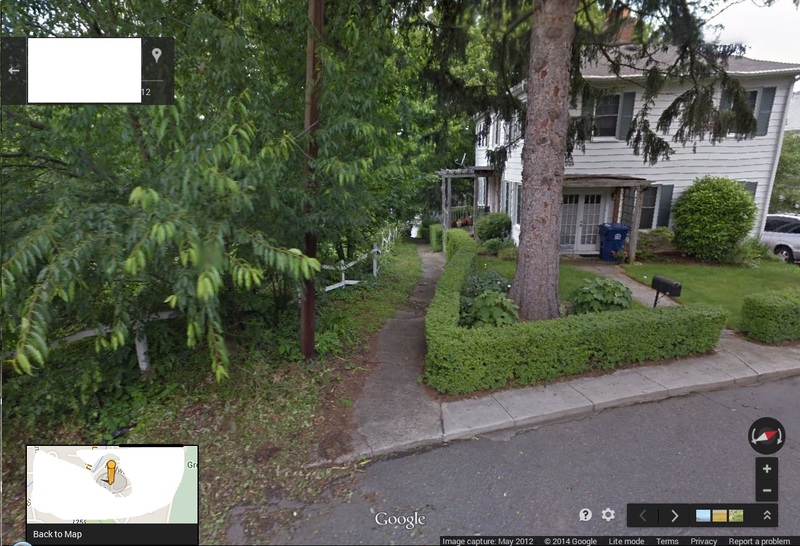 We reach the intersection with the side street where the 2 pairs crossed as we entered Cherry Avenue. The symmetrical nature of the traffic islands becomes more clear. We are also about halfway between the 2 pairs of walkers at this juncture. We are almost on top of the middle part of the first set of traffic isles. 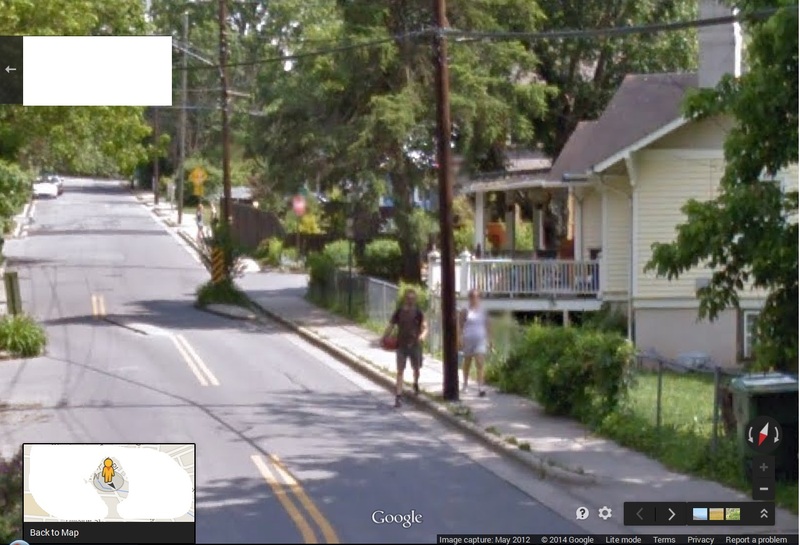 We can now see that the couple still ahead of us is a man and a woman, with the man holding the orange basketball. 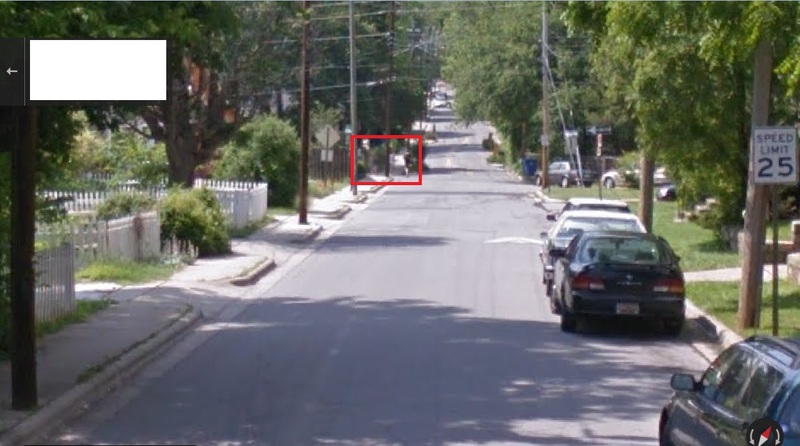 The 2 girls continue down the street in the opposite direction. 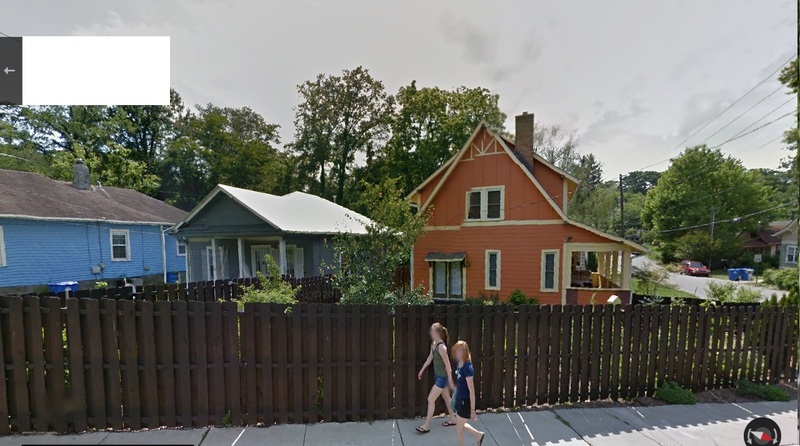 The girl with the orange hair has turned around to look at the Google Map car snapping these pictures. 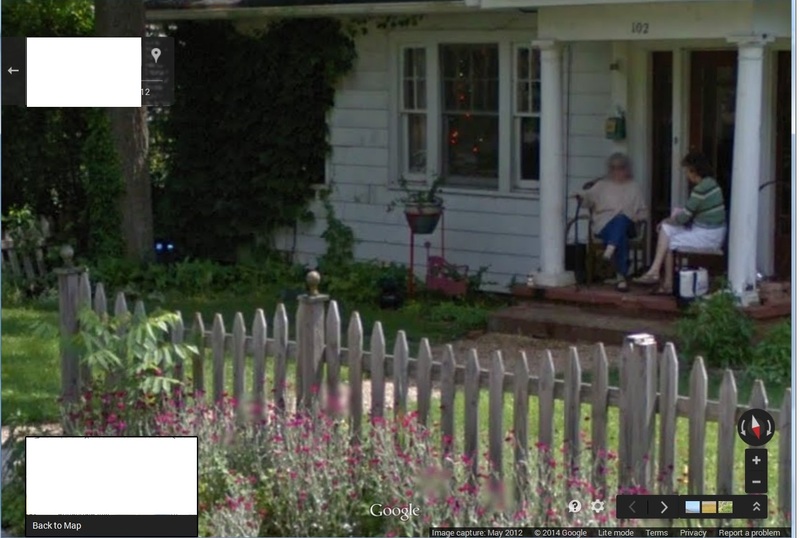 We pull basically even with the man and woman couple, or as even as we can get in our Street View. 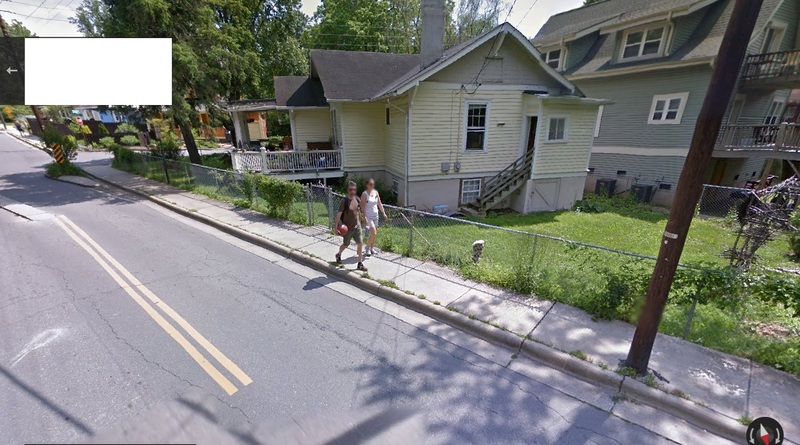 They notice the Google car for the first time; become aware they are being photographed. 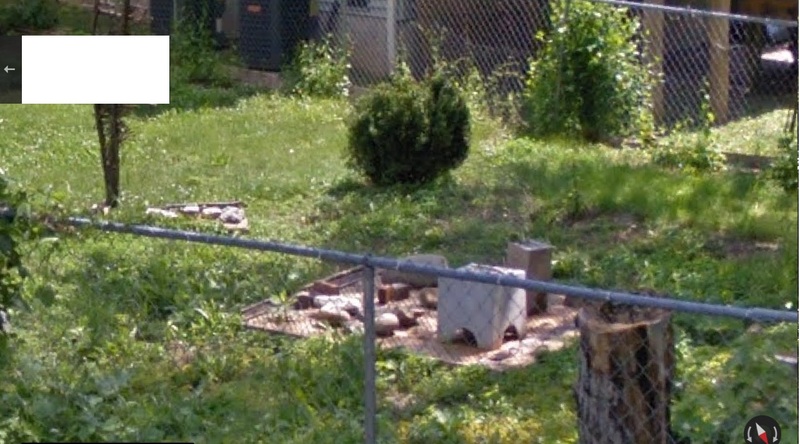 They are also passing a mysteriously placed rock cairn to their left, just behind the chain link fence. The cairn looks unbalanced, top-heavy. In this position, we are also as close to a midpoint between the two symmetrical sets of traffic islands in this part of the road as we can get. 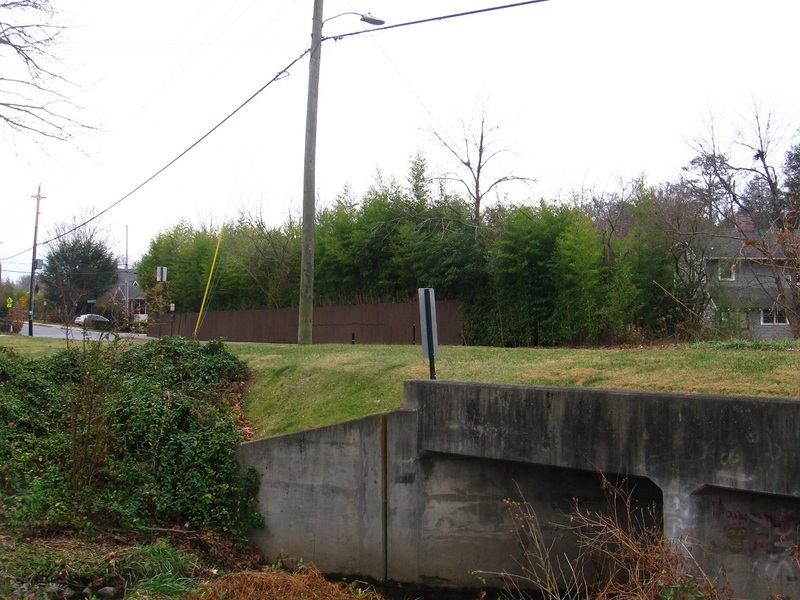 We are also just at this time crossing a creek that flows under the road. 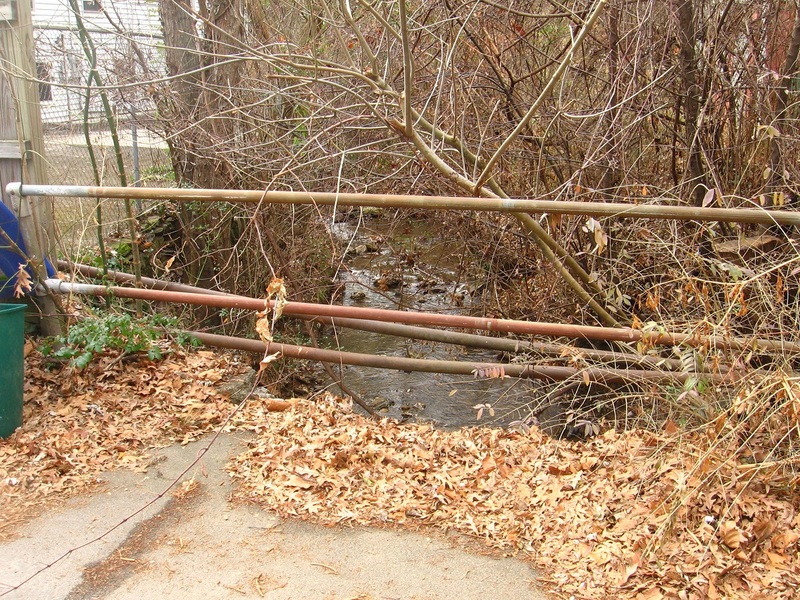 This is the same creek that runs by the house with the fairies parked in the front yard discussed previously. The creek (as yet unnamed) has power. 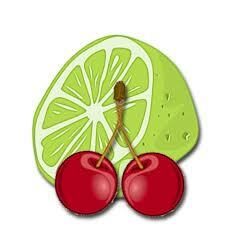 The neighborhood is called Cherry Lime after the 2 main streets. 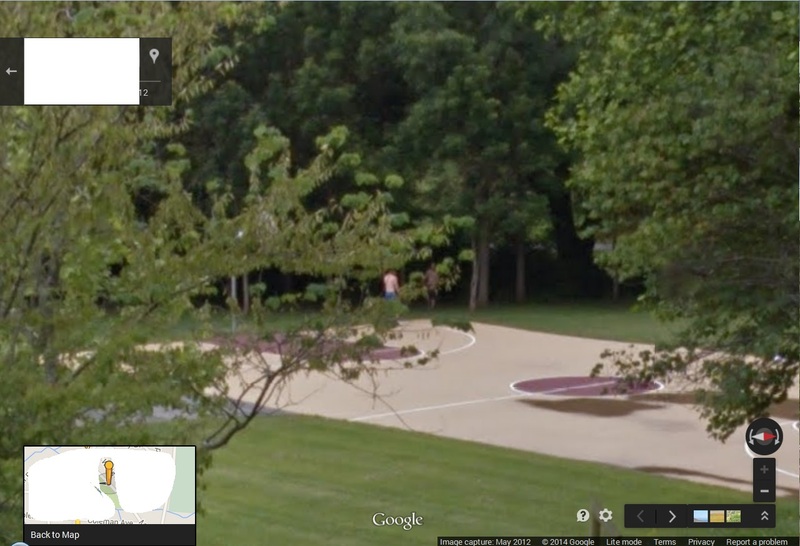 Our little Google Earth orange basketballhead figure stands atop the creek on Cherry Avenue. Cherry, Lime, and Orange together, then. 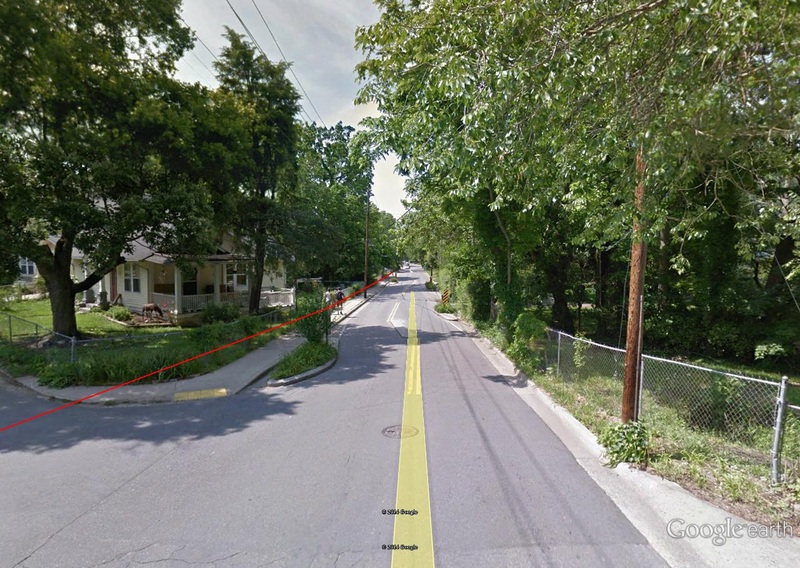 From this point on northward, the creek will basically parallel Cherry Avenue, adding to its energy. The 2 actually become one at this time, most likely. 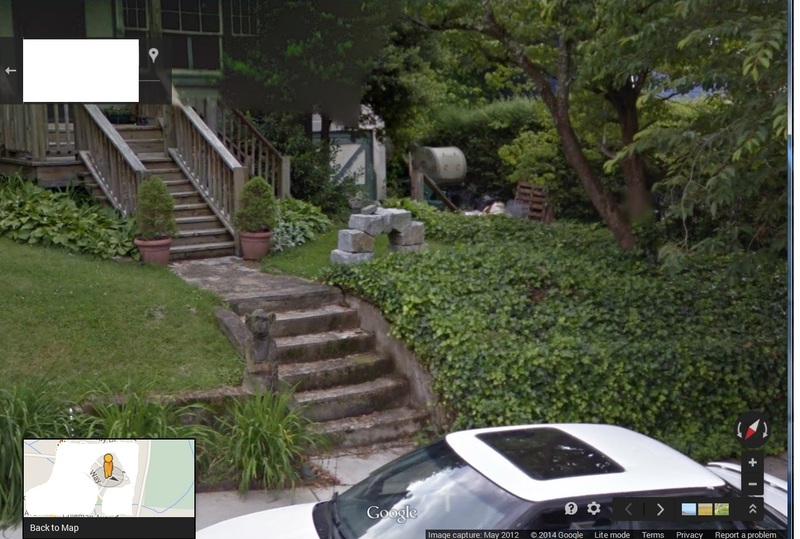 Moving one step north in Street View, we can view a type of rock village beyond the fence. This is the only place we see this clearly. It seems to make some kind of natural pairing with the rock cairn to its left here. Then one more step brings us directly atop the middle of the 3 far traffic islands. 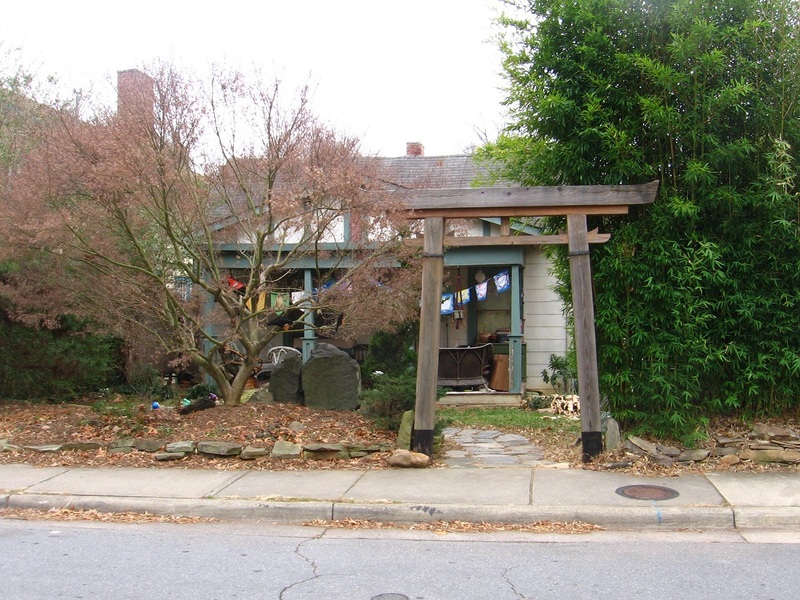 Interesting house in front of us here as well, with a type of Japanese torii gracing the entrance. We’ll see another torii down this street soon. You can tell by the little map that we are just beyond the creek-road conjunction mentioned before. In the other direction, the man and woman are passing directly beside the rock cairn. 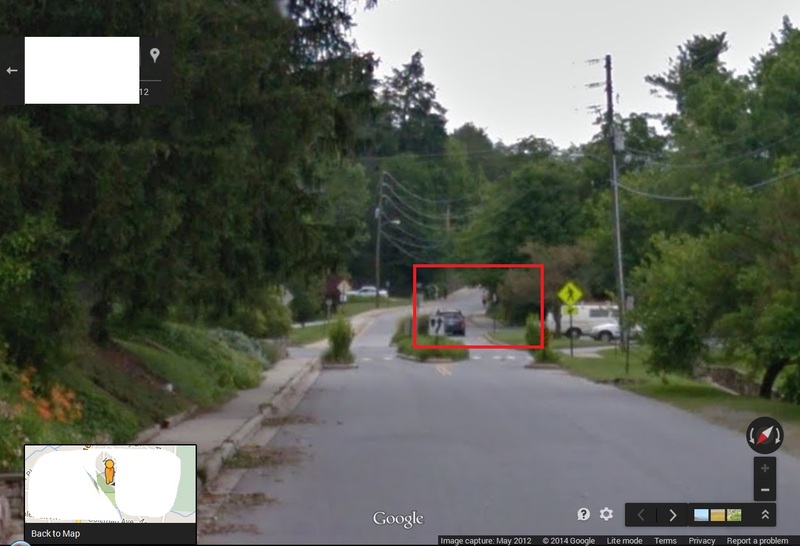 The 2 girls are still staring at the Google car, fixed in their places. These are still the only people we have seen on this street. 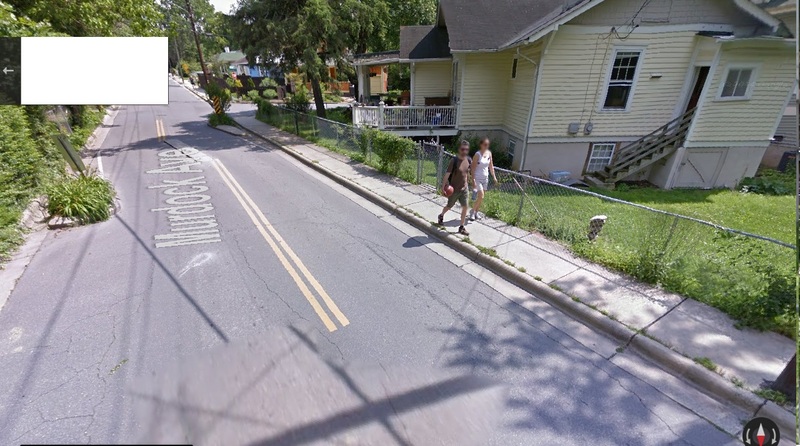 Indeed, they are the only walking people that will be encountered in Street View along this 3/4th mile avenue. 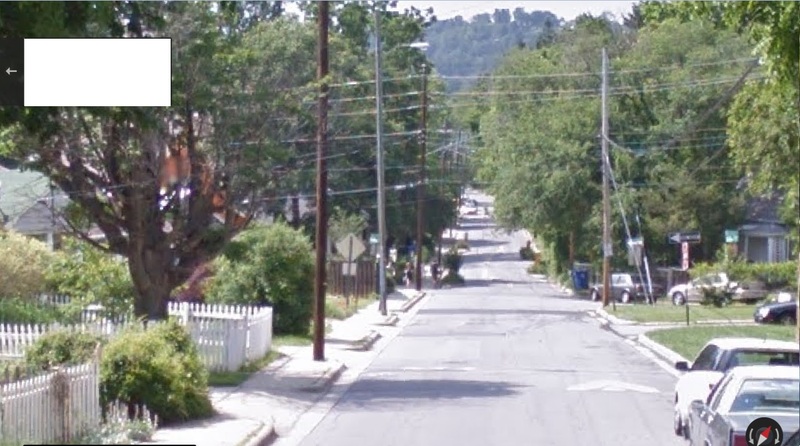 What are the odds that they just happen to be exactly side by side with each other as we start the journey up this street from the south terminus? The drama then seems to fade as we move past the far traffic islands into uninterrupted street again. In the next step, the 2 girls become permanently irresolute. What have we just passed here? I personally believe it is the essence of a collage. 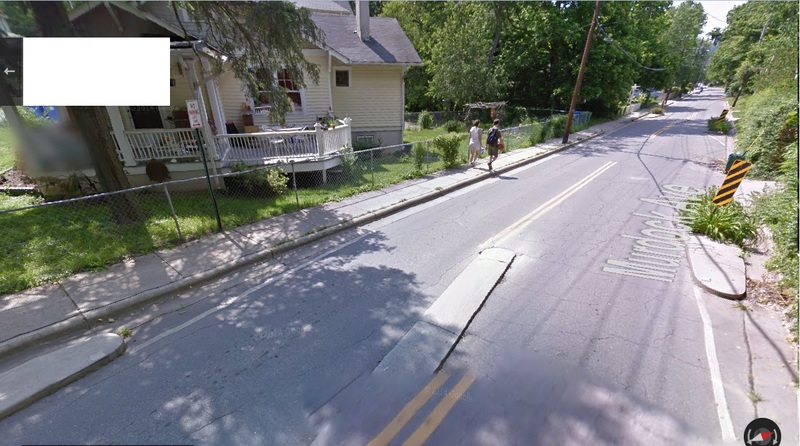 On the *other* side (north terminus) of Cherry Avenue we have this man with his hand in the middle of a sewer top. Is he a guardian of the underworld, perhaps the one directly beneath the gray surface of Cherry Street and its numerous islands? He must know about the 2 sets of twins from the other side of his 3/4th mile long avenue. He must somehow be in control of the islands. Many Islands. What an odd thing for that woman to do. Reminded me of my sister. Lānaʻi (/ləˈnaɪ/; Hawaiian: [laːˈnɐʔi] or [naːˈnɐʔi]) is the sixth-largest of the Hawaiian Islands and the smallest publicly accessible inhabited island in the chain. 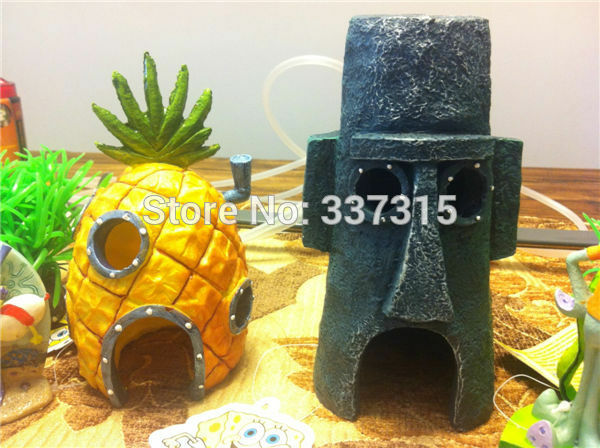 It is also known as Pineapple Island because of its past as an island-wide pineapple plantation. In 1922, James Dole, the president of Hawaiian Pineapple Company (later renamed Dole Food Company), bought the island and developed a large portion of it into the world’s largest pineapple plantation. Pineapple, Alabama has already been mentioned in this blog. 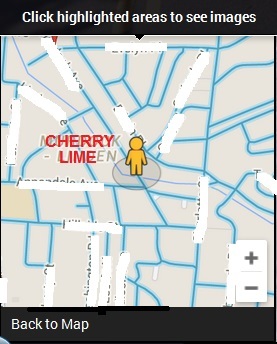 The tiny town has a Banana and Cherry Street. Does it give further clues? Most likely. 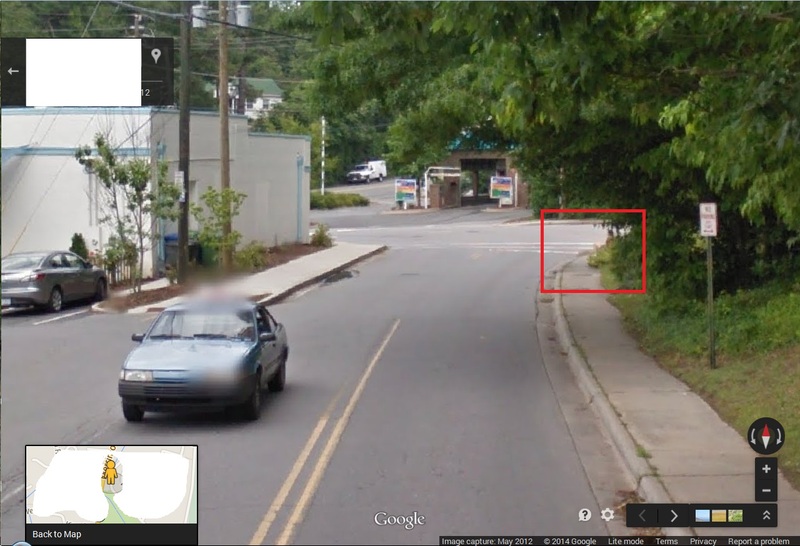 Perhaps the whole Cherry-Lime area of Ashville is actually called Pineapple. Or was (or will be). And in reading the above link concerning Pineapple, see that I’ve already mentioned Cherry and Banana Street in this, and even provided a picture. I’m still uncertain about the relationship between Apricot Bone and Sgt. Pepper. Is Apricot Bone a pretend band as well? I think you said before that it’s a Kinks variant band, like they also could have created in 1967. Instead they created the Village Green Preservation Society. “We are the Village Green Preservation Society”. Apricot Bone is something else. 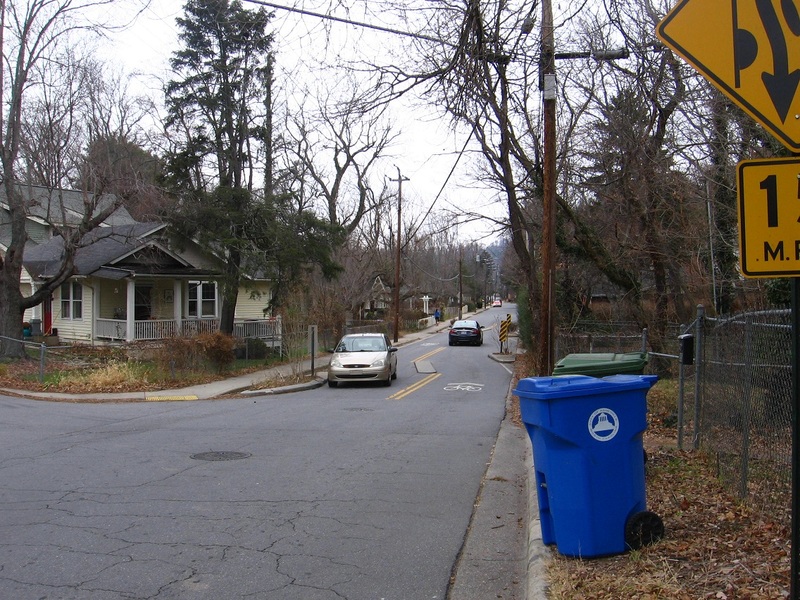 Related to Pine Apple, Alabama and its Banana and Cherry Streets but more. Apricot is King Tull… 333. A tropic fruit. And this is across the street. I’m not sure I understand completely unless there’s a Rum Avenue nearby. 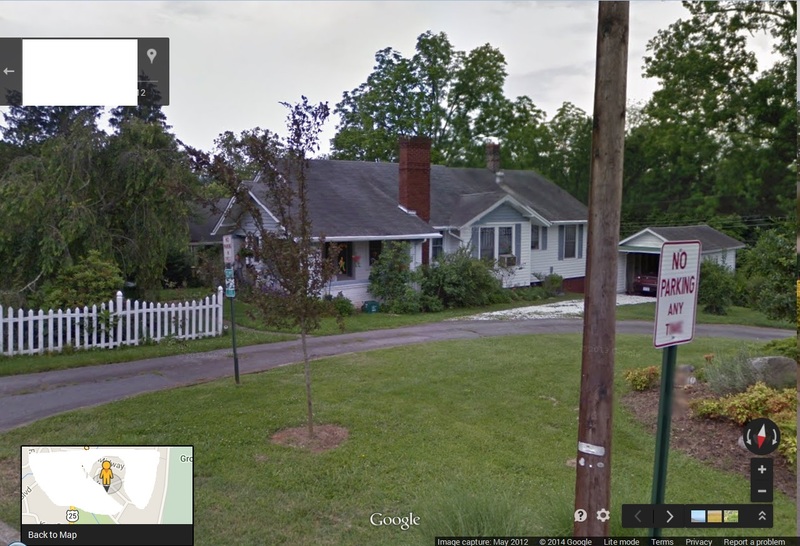 Turns out this Earl Weaver Park associated with House 39 of the Norwegian Wood neighborhood of A-ville is perhaps part of a *second* Google Maps art event of Cherry Avenue, which creates its western boundary. This involves [traffic] islands again. But let’s return to the above article for a bit more information. We’ll get back to the 39 residence. 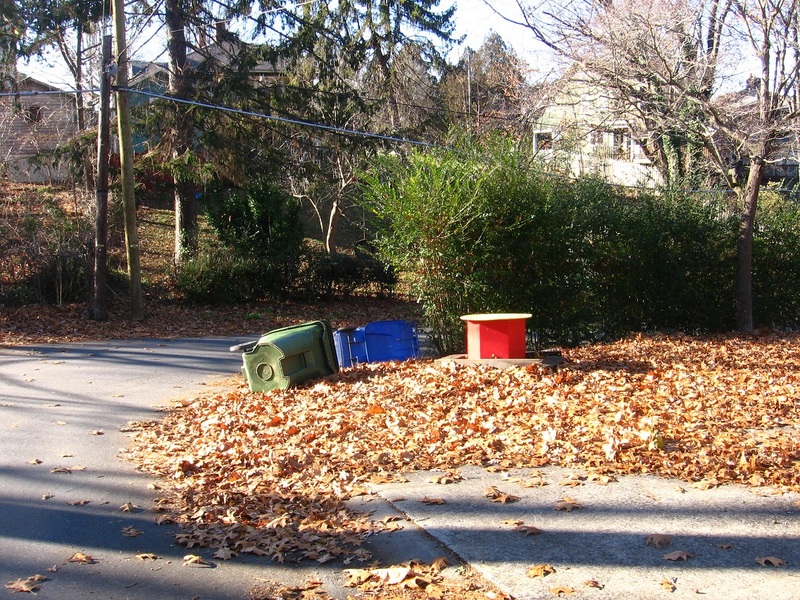 Nor[wegian W]ood Park was part of the “suburb beautiful” movement taking place all over the country. This movement consisted of a design philosophy which included a curvilinear system of street design that paid close attention to the natural topography and incorporated within its boundaries amenities such as large lots, sidewalks, tree-lined streets, open spaces, and elaborate high-style houses following the latest architectural trends of the day. 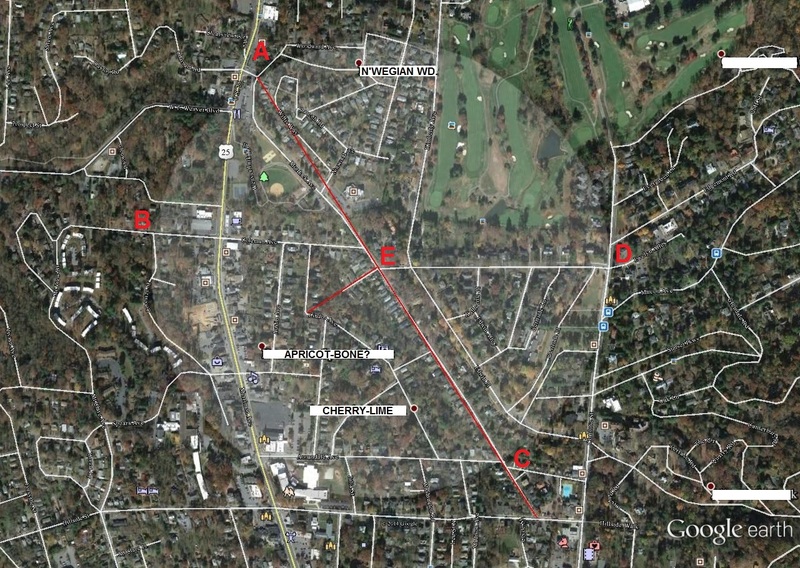 This first layout included Virginia Avenue (later renamed Nor[wegian W]ood Avenue); S. Woodward Avenue; Woodward Avenue; Midway Drive; and Lynndon Road (later [Cherry Avenue]) noted on the plat. 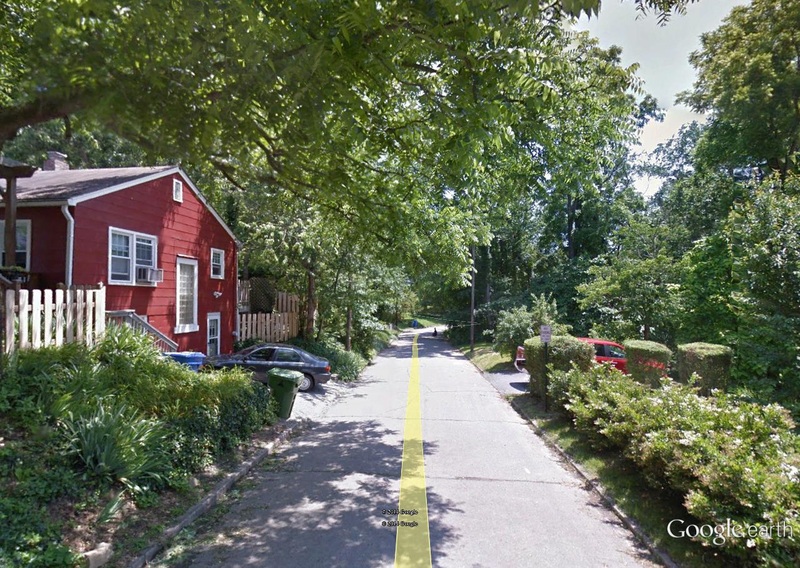 So this seems interesting: the original name of Cherry Avenue is Lynndon Road. But this is perhaps a falsity in our closed world of the Frank and Herman Einstein! blog. It brings to mind John *Lennon* who penned the song “Norwegian Wood” in 1965 that the neighborhood was obviously *not* named after, being platted a half century earlier. First, does Lynndon actually translate to Lennon? 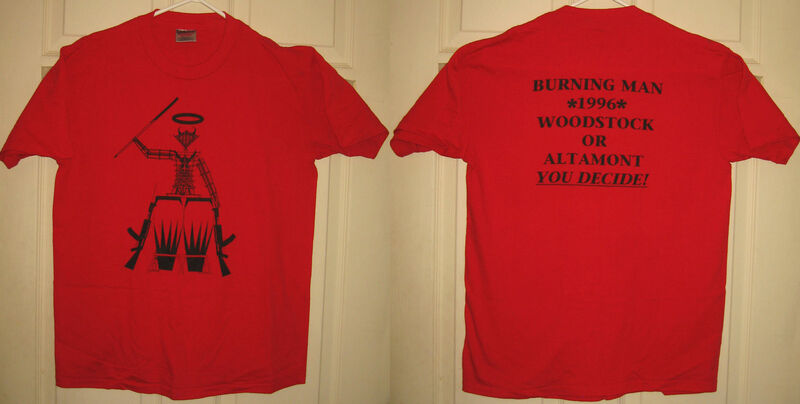 And then does the Norwegian Wood neighborhood lend its name to the song instead? It’s also important to note that a British lime tree is called a linden tree, but unrelated to the lime fruit. I think Lynndon comes from Linden, and then this translates to the Lime Street running parrallel to what was then Lynndon Street (and what is now Cherry Avenue). What I’m getting at is that Lynndon and Lime street names here have a common origin in Linden, and this is probably related to Lennon via Norwegian Wood. So what is the time order? 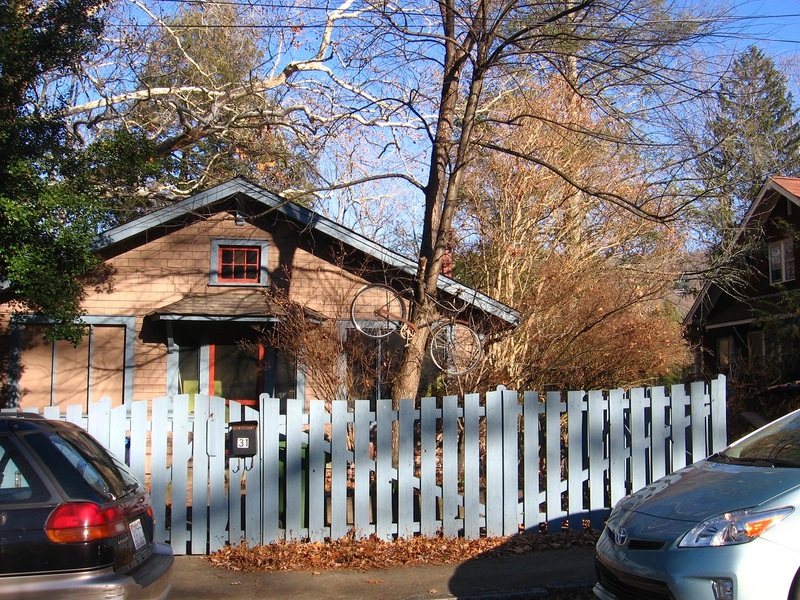 Lynndon Street predated the Norwegian Wood neighborhood or development. Lime Street as well. 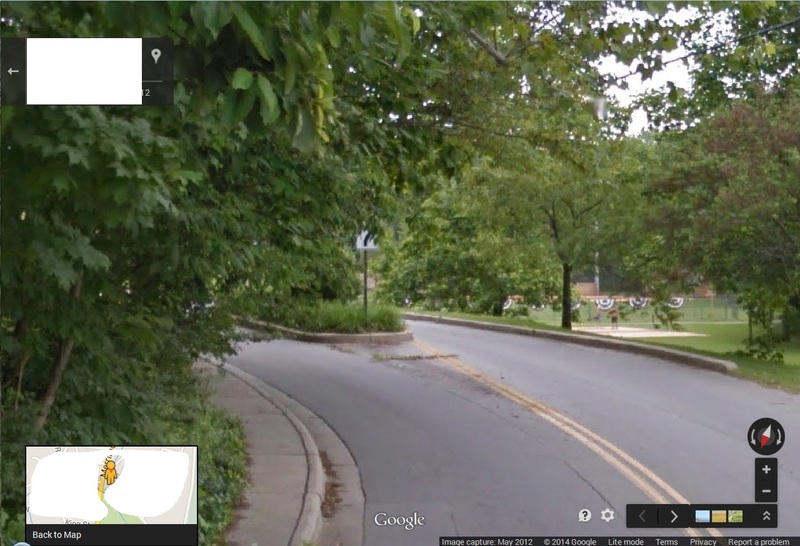 But Lynndon Street leads directly *to* Norwegian Wood, passing by Earl Weaver Park as it does. And the above article mentions that Earl Weaver Park was once a field associated with House 39 of what would soon become [the center of?] the Norwegian Wood development. So here’s what’s happening, I think. *Linden* is the name of the *stream* running precisely between what is now Cherry Avenue and Lime Street. Cherry Avenue use to be called Lynndon Street, so the stream gave that street its name, I feel. The Linden stream also gave Lime Street its name. It might have come from [linden or lime] trees bordering the creek, and also perhaps named by someone of British descent (?). Anyway, the Lime Street name may have been coined after parallel Lynndon Street, with the latter name then changed to Cherry Street or Cherry Avenue, perhaps part of a fruit naming scheme. 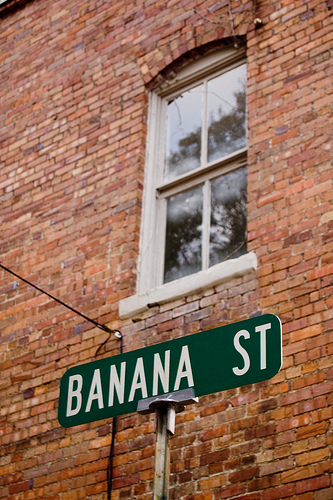 In Pine Apple, Alabama, we just so happen to have a Cherry Street coupled with a Banana Street, as we’ve already reviewed in several previous blog posts here. 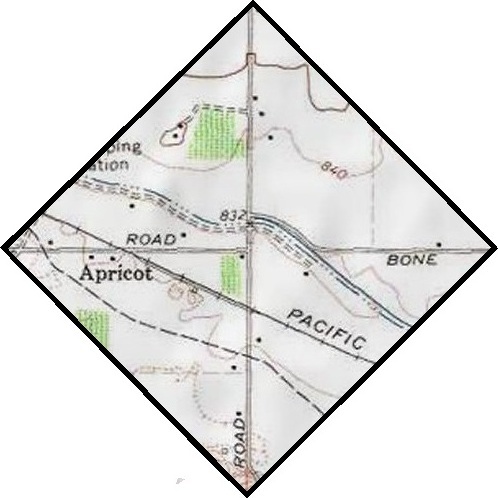 Following Highway 10 out of Pine Apple to the east, its name changes to Pineapple Highway in the next county over (Butler) where it passes through a hamlet named Saucer that we’ve also mentioned on this blog in reference to the Forest Home Circle. But to my map pictures created today. In the first, I attempt to illuminate the fact that Saucer and Fake Herbert are equidistant from Forest Home, or a distance of 2.8 miles. 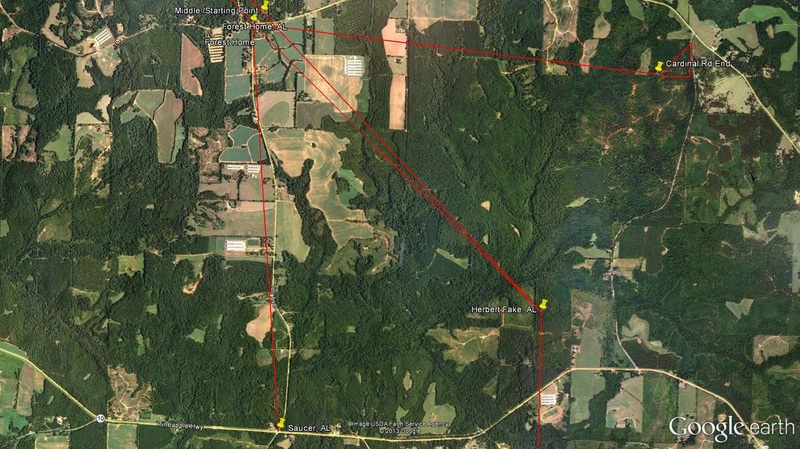 Fake Herbert is discussed in this earlier post a bit: when you look up Herbert AL in the GNIS database you are directed here instead of the actual location of Herbert in this state, which lies about 28 miles south in neighboring Conecuh County. 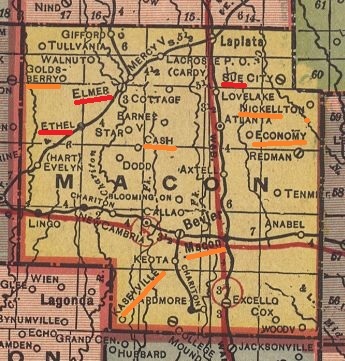 Interesting as well that two *same named* roads become linked within this Alabama circle (Cardinal), just like we have Lynndon and Lime street names originating in a common Linden stream running parallel to and between both, hypothetically. 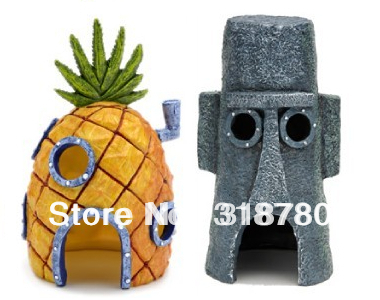 But certainly a key word here is Saucer, and on the Pineapple Highway. Note that this highway is spelled exactly like the tropical fruit, and not with two words like the obvious namesake town of Pine Apple. It has become aligned with this fruit related complex of names, whatever that is. And I think it actually originates from Saucer, but I’ll have to save that for a part 2. 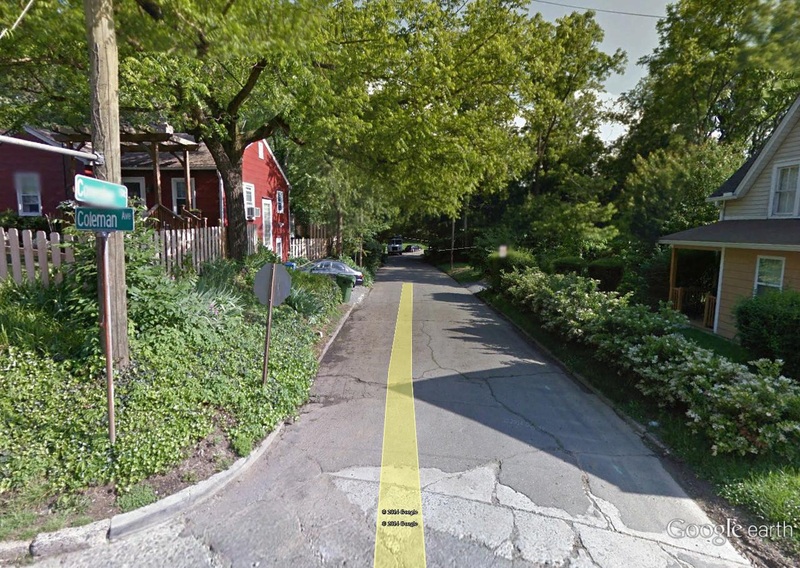 I’ll also get to the second proposed Google Maps art event involving Cherry Avenue asap. 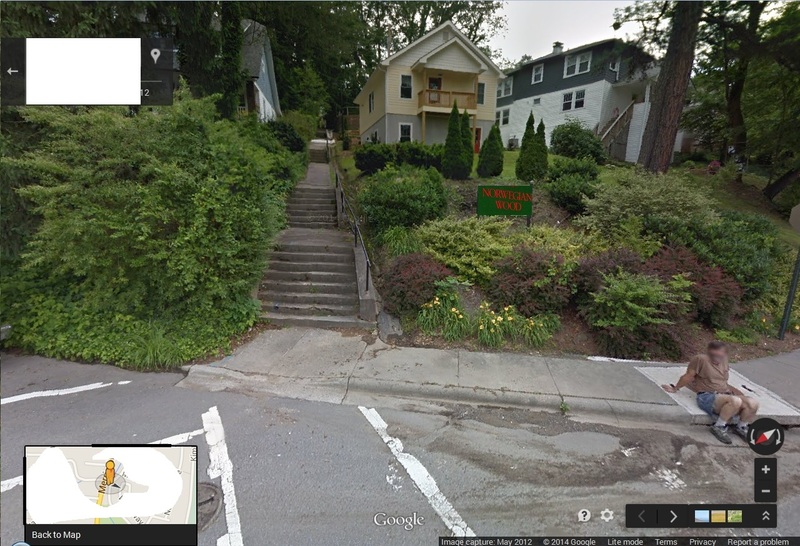 … and on Norwegian Wood Avenue, just uphill from the last picture of the following post. House 39, one of the two oldest residences in this neighborhood, built ca 1910. 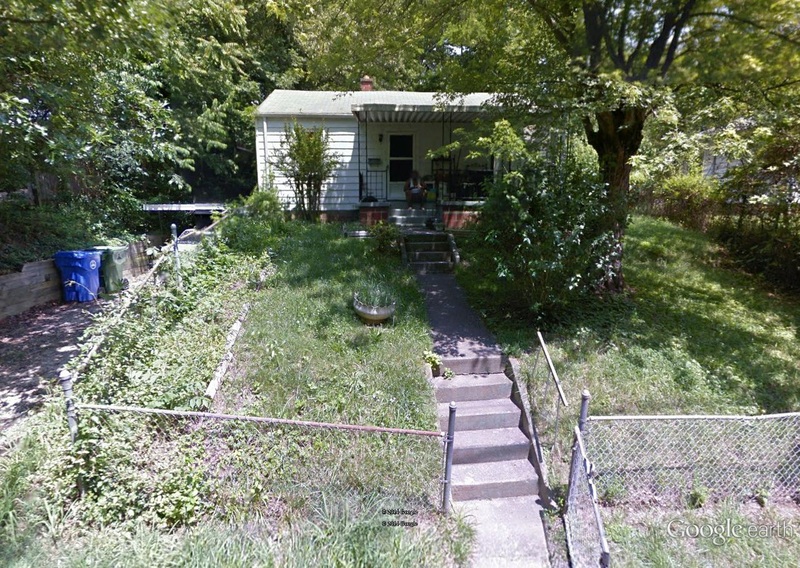 Looks like it is for sale now, or perhaps someone is moving in presently. Hope they take good care of it. 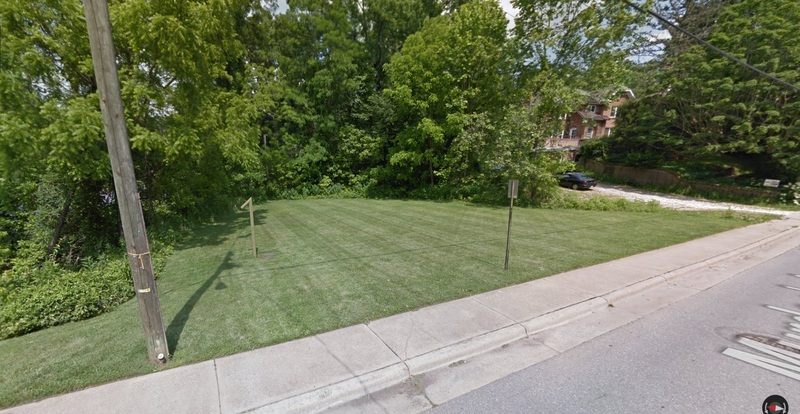 According to another Norwegian Wood related site, this property was once “associated” with Weaver Park, which I take to mean that whoever owned the house also owned the mentioned field that later became the recreational area. 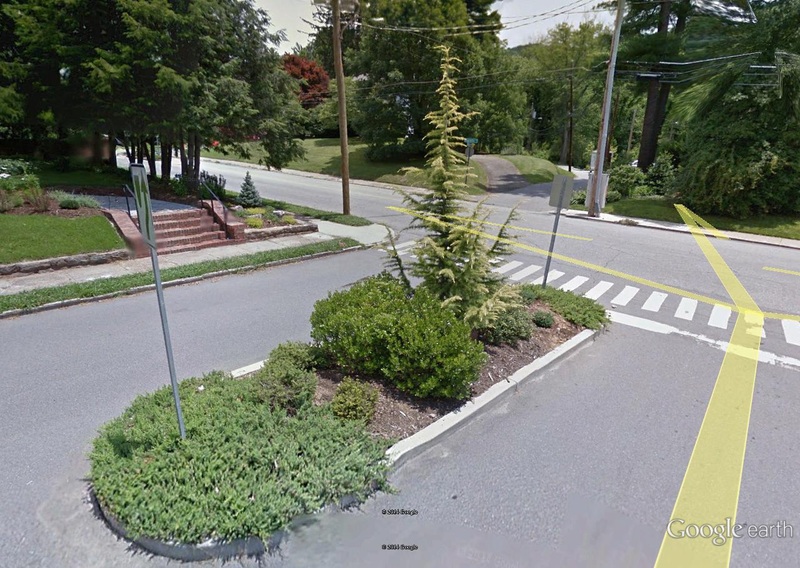 Interesting “traffic island” bordering this property. 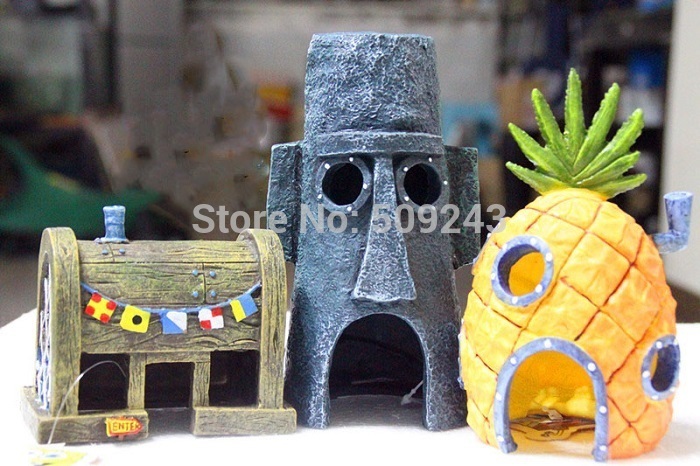 Strange puppet-like things dangle from the porch of a house on the opposite side of this island from House 39. 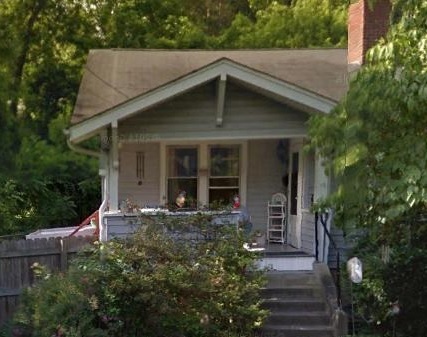 At least one more, similar looking object is draped over the porch wall in front of the house, where a seated elderly lady chats with a younger woman leaning against a baby stroller. 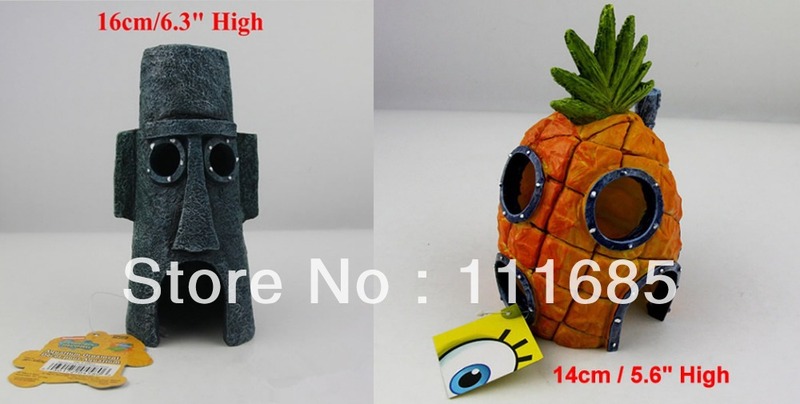 Are these toy avatars? 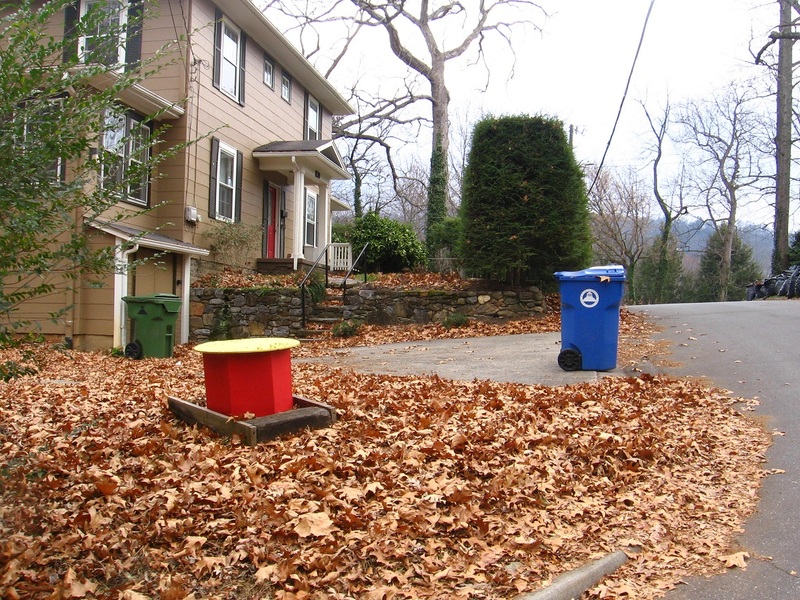 Do they harbor the secrets of Linden Creek, and Cherry-Lime and Norwegian Wood neighborhoods of Ashville? Are they somehow kin to the fairies found in front of the house bordering this Linden Creek in Cherry-Lime? Is the Norwegian Wood traffic island the mother of the much more modern ones on Cherry Avenue somehow? Several of the latter lie only about 200 feet downhill from here, a short jaunt even for a foot high toy avatar. 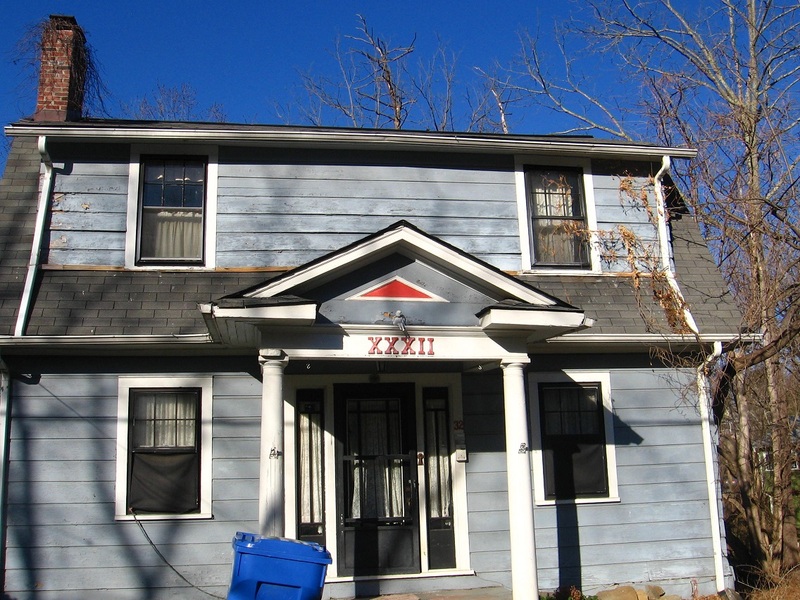 I will also keep monitoring House 39 down through the years because I believe it holds secrets as well. John Lynndon (former “Mr. Murdock”). House 39 just up the hill, up the stairs. … and at the same time the very tip of Cherry Avenue’s first “island” comes into view from the opposite direction. One snapshot closer: island in plain view. John Lynndon now totally gone in the other direction. Two boys playing basketball in Earl Weaver Park also first come into focus, also our first good glimpse into the park from this direction. 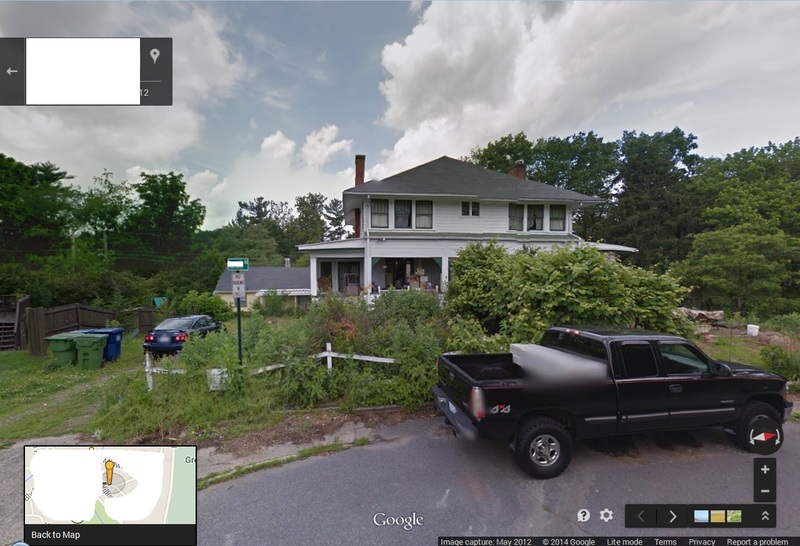 Like I’ve said, House 39 is directly associated with EWP, and the owners of the house probably also owned this land in the first part of the last century at least. 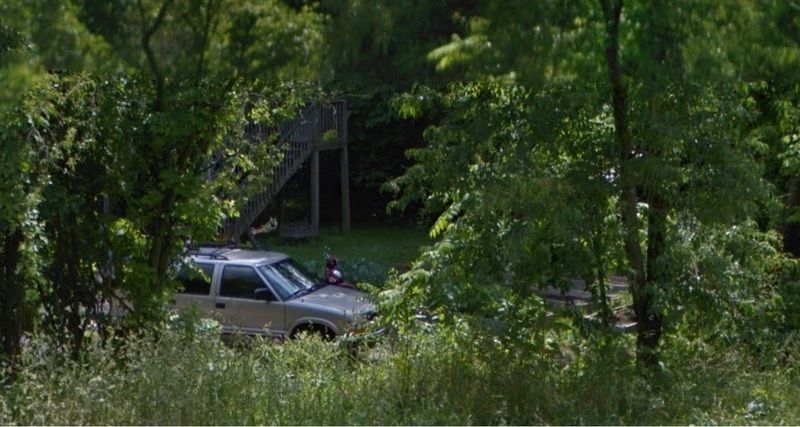 Basically we’ve exchanged John Lynndon for these basketball players in our trek south on Cherry Avenue in Google Maps Street View. As the former goes out of sight, these two come into sight, along with the island. We are already seeing parallels with what happens at the *southern* end of this same avenue, reviewed in the “Found Art Event (!) 02” post below. This is, in fact, the start what can probably be seen as the *second* such art event of Cherry Ave., north mirroring south. 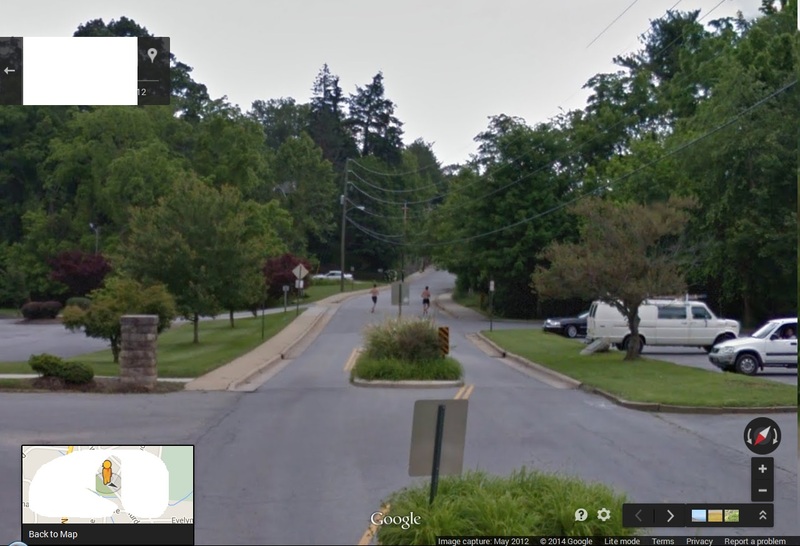 After being hidden for one photograph, the basketball players come back into view just as we pass the northernmost traffic island of the avenue. More islands appear down the street now. 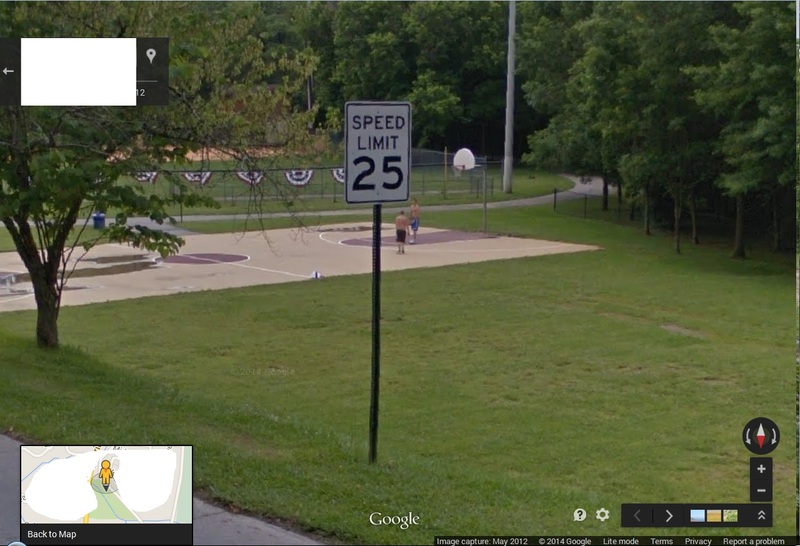 Next photo: the boys unknowingly pose below the lower right corner of a speed limit sign. 2 photos south: boys entangled in a second road sign. Are they the occupants of the seesaw? They are at least similar players in the park to these abstracted seesawers. Speed limit has lowered from 25 to 20. As we pass 2nd large traffic island of Cherry Avenue still heading south, the players disappear, just as they appeared when we passed the first large island. We see them fairly clearly one last time several photos down. 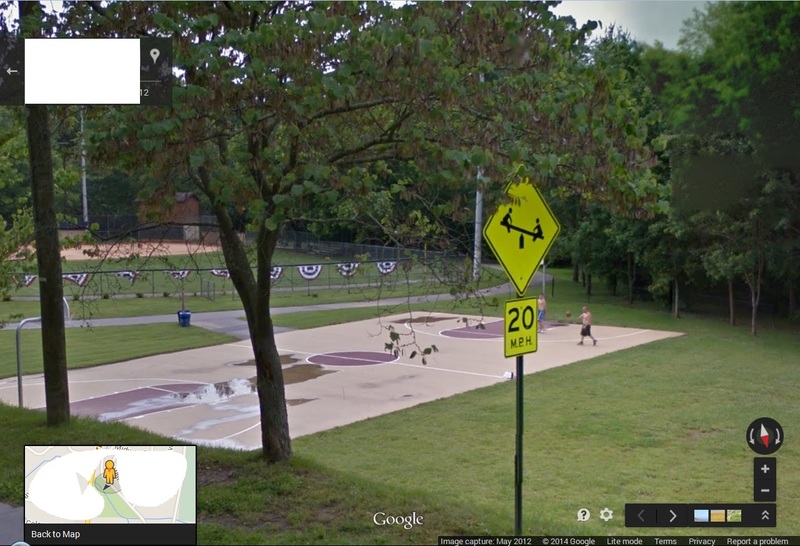 The man in the darker trunks has now moved off the court and into the edge of the woods for some reason. Is he retreating back into the shadows? 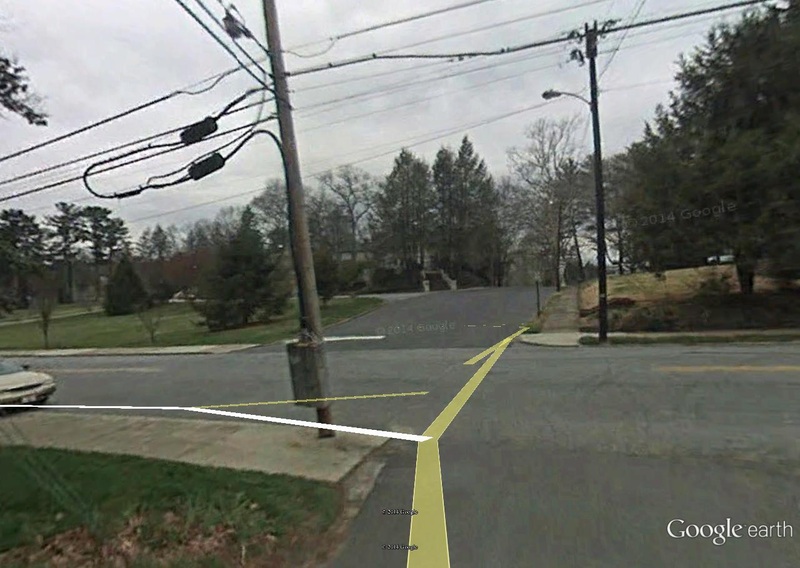 In the same 360 degree photo, 1 of 2 paired runners first appears clearly to the south. Another exchange has seemingly taken place. I’m still analyzing the motion of the 2 runners, moving backwards as we go against the grain of time in continuing to head south down Cherry Avenue. 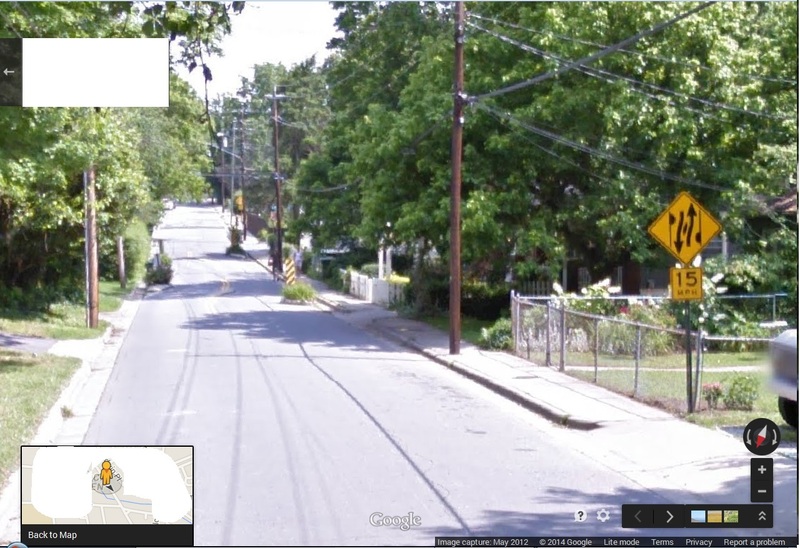 At one point, they seem to frame the edges of the last large traffic island in the northern part of this street. 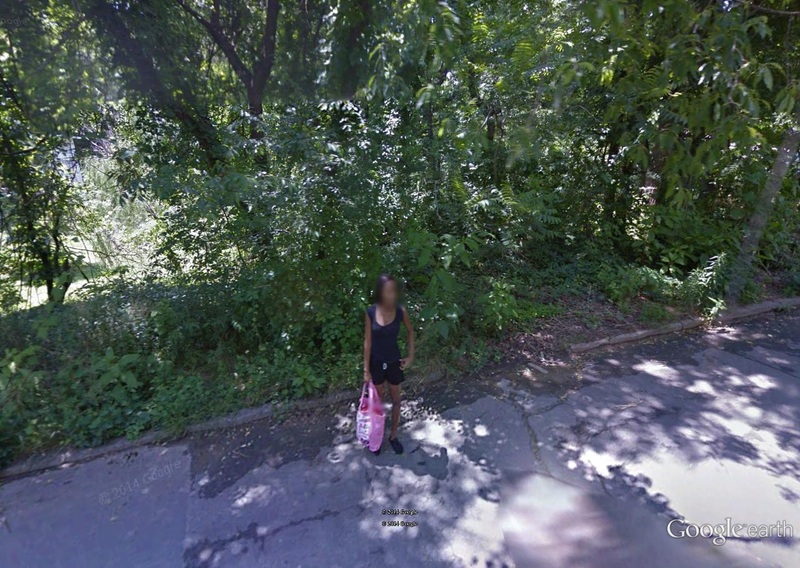 And then they first appear in Google Earth Street View as we enter Cherry Avenue from Norwegian Wood Avenue to the north. But if we just head down Cherry Avenue without this small detour, the runners seem to vanish as we pass the second to last large traffic island (of 4). I’ll have to go into details about the islands in another post. My initial theory is that with this disappearance the art event has also ended. All that’s left is to figure out what’s going on with it, and how and why north mirrors south. Another Frank and Herman Einstein post mentioning a different Norwegian, this time a ridge in Idaho. Notice the word Wegian is distilled from Norwegian in this post. Now, removing Wegian from Norwegian Wood gives us Norwood, which is the actual name of the neighborhood as I’ll tell you now. Switch from fantasy back to reality, then. Norwegian Wood mentioned at the bottom of that December 2012 post as well. But Hucka D. is emphasizing that we must continue to *mystify* Ashville and its neighborhoods, instead of *de*mystifying. So we have Norwegian Wood, Cherry Avenue, Lime Street, and Linden Creek instead of their actual names. Well, as far as I can tell Linden Creek doesn’t actually have name, so this is a coined word for an unnamed stream in reality. 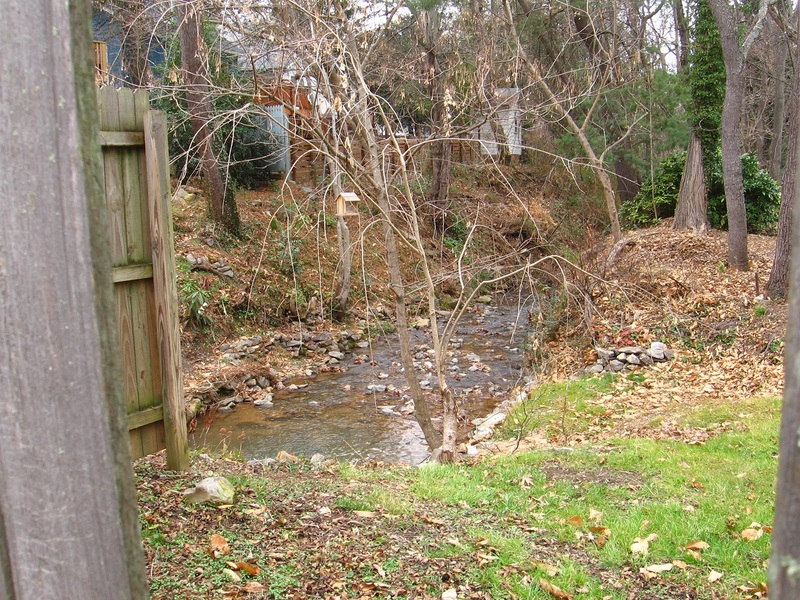 And now I also have a name for the stream that it joins: Read Creek. 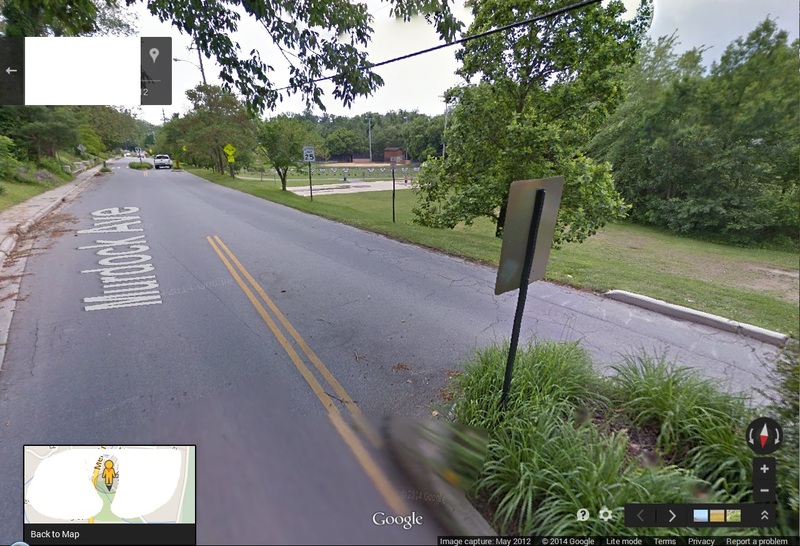 And Earl Weaver Park may have been originally called Read Creek Park or just Read Park. The fairies or toy avatars or elves or whatever inhabits the Linden Creek area in mystified reality have preserved a bit of this original park across the road from the present park, but still on Read Creek. I don’t think I’ve mentioned that in Earl Weaver Park we find the actual conjunction of Linden and Read streams. I viewed the conjunction in person several weeks back, and found the two streams almost equal in size at that place. Nevertheless, the Linden name is absorbed into the Read name at that juncture, terminating the former. 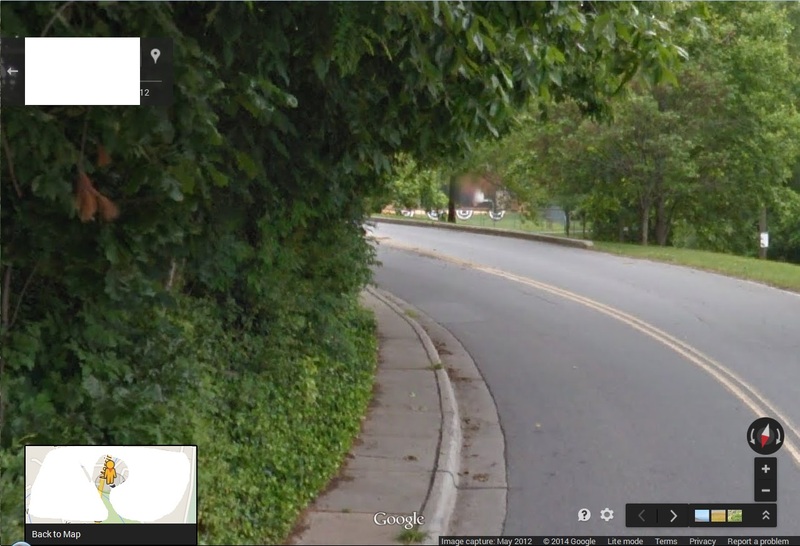 You cannot see the stream confluence in Street View, and I didn’t take a picture of it while there. I’ll rectify that soon enough. Bit of Read Park preserved by the Linden aliens. Across the road: what appears to be one of the aliens resting atop a car, Linden Creek just behind. Nearby bamboo grove. We know the wee people love river cane! 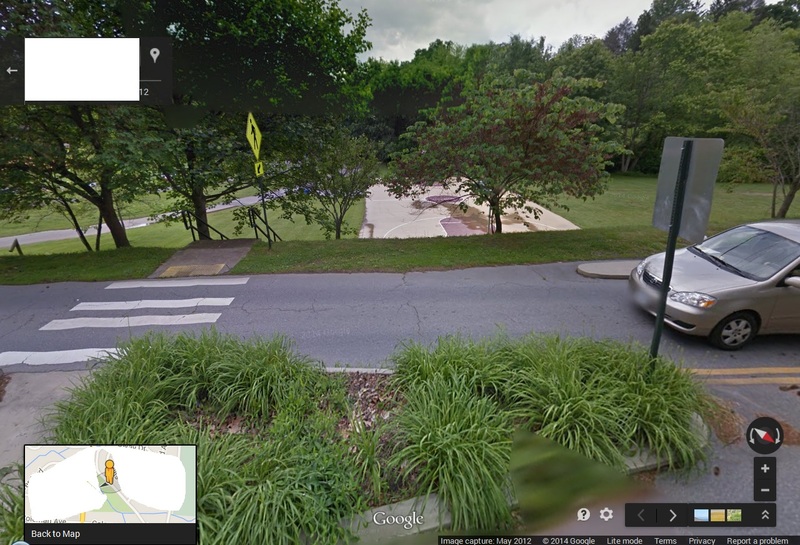 In Read Park, when it is restored to its original name, we will find a monument to TILE starting with “I”. We know Norway is North, referring to Nordic aliens, seen as superior in most eyes to the Southern ones, sometimes called Greys or Reptilians. This is oversimplification pure and simple. The Nordics are more *us* — or you I should say, baker b. The Reptilians are more *them*. Can you trust Greys? Can you trust anyone? Is a human being from the South during Civil War times necessarily evil because he doesn’t understand the human tragedy of slavery? Do they have a Hart? Orchard City: A(B)C(D)E. READ just below. One of two other US Read’s above Murdock in Utah. 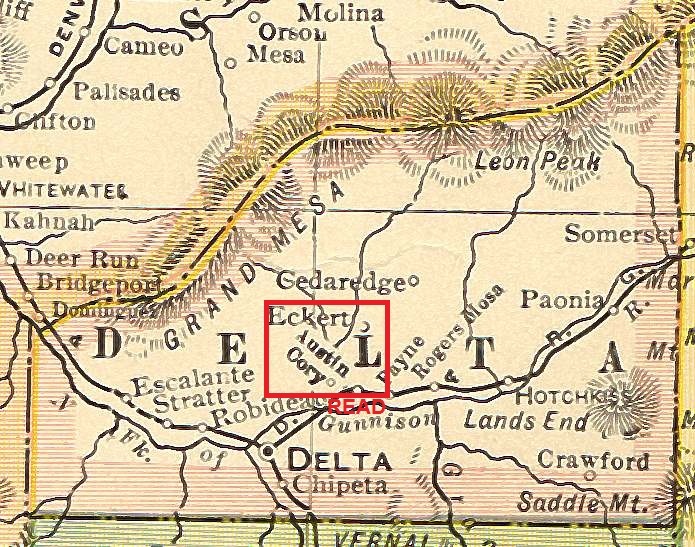 Orchard City, the second largest municipality in Delta County, is home to 3,100 residents and is the largest municipality in terms of square miles in Delta County. 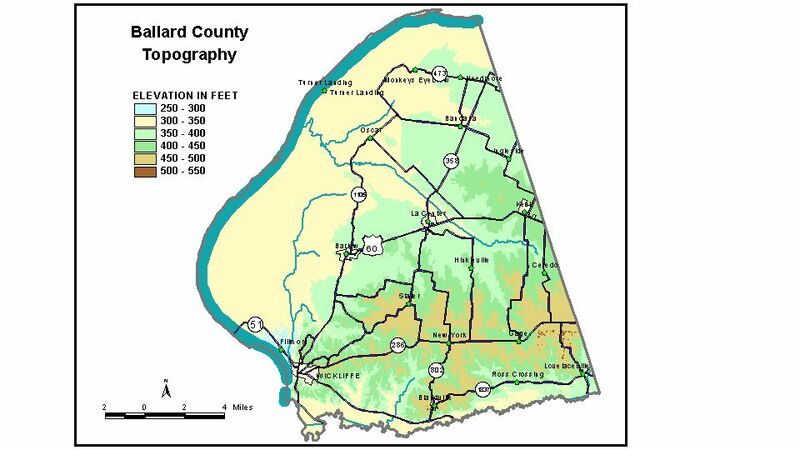 Despite its size, Orchard City is primarily recognized by the names of three smaller and older areas within its boundaries: Austin, Eckert and Cory. They all had separate beginnings, but somehow through a unique course of events came together. The following is a condensed history of how Orchard City came to be a town of three communities. The names Austin, Eckert and Cory have existed since the turn of the century. 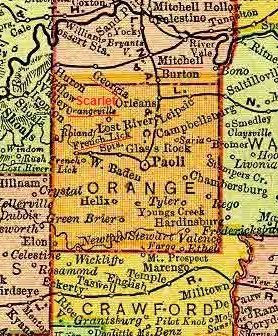 In the 1900’s, the entire area, including Cedaredge to the north, was solid with orchards of peaches, apricots, cherries, and apples. The area was gorgeous. 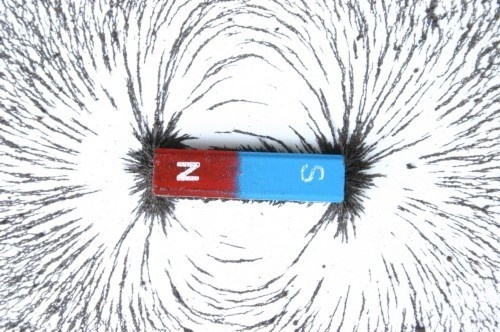 Cherry Avenue is a Magnet? 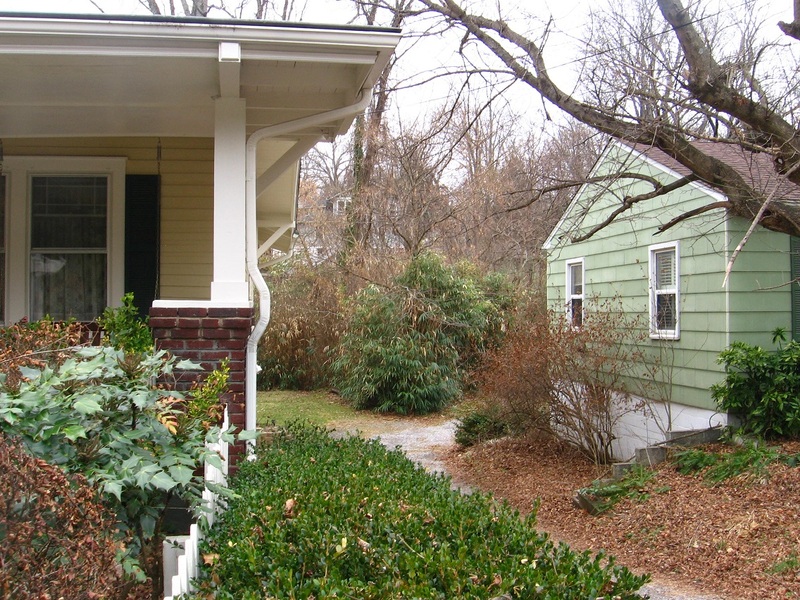 Apricot-Bone is probably also the name of a mystified Ashville neighborhood. 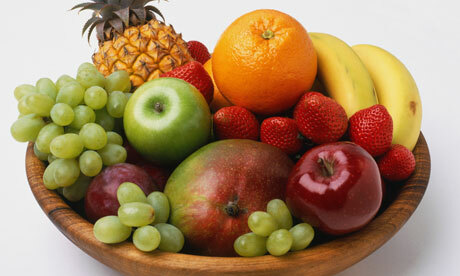 It’s definitely a fruit bowl situation. Yes, we have no Bananas, but Bandana is close. Close to Monkey’s Eyebrow that is. And formerly Skillet. Have a great day! It was also tilted backwards, so if it had the “traditional” turret it remained out of side on the far side I couldn’t see. Or perhaps I was looking at it frontwards. I say this because it was dark during the sighting and as I remember the UFO was darker than the surrounding trees and sky. I can’t remember any details about the saucer except for the lights and the shape. And the size! I’m not sure how a UFO of that size could appear in the small parking space behind my apartment. And an even odder thing: when I checked the next morning, I realized that the Ashville skyline was also hidden by the building I was in, so I *couldn’t* have seen the skyline that night. The skyline was *almost* visible but I’d have to be leaning impossibly far out the window that night to see it. And I didn’t have the window open. How did I happen to be looking out this bedroom window to see the UFO? Well, I was awoken by a strong white light coming through it and illuminating the room. I immediately jumped up out of bed and went to see what the source was. I guessed “UFO” as soon as my brain was jumpstarted. There’s more to the story, including a movie we viewed just before the wife left that night dealing with, yeah, aliens (this was shortly before we got married, and she was living in a different apartment, more out in the country). I might have doubted the sighting more except it had happened before. The wife and I both saw a UFO plain as day while driving in southern Virginia in 1985. That’s another story in and of itself. 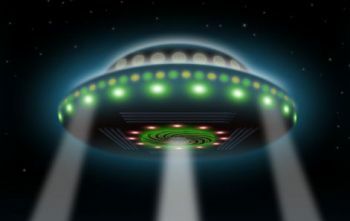 But the UFO then wasn’t the classic saucer shape. It appeared more like The Enterprise vessel of Star Trek. The Ashville UFO was a simple disk from my perspective. A very dark disk with flashing lights around the edges. 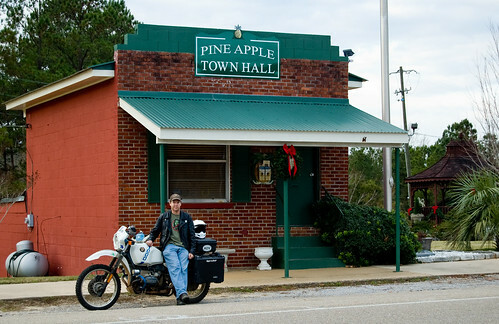 Let’s return to the tiny community of Saucer, Alabama, then, on Pineapple Highway which leads to Pine Apple in the neighboring county to the west. Could *that* Saucer* relate to *Ashville’s* saucer, since the same town, during its continued mystification process, has attracted so many other fruit related names? 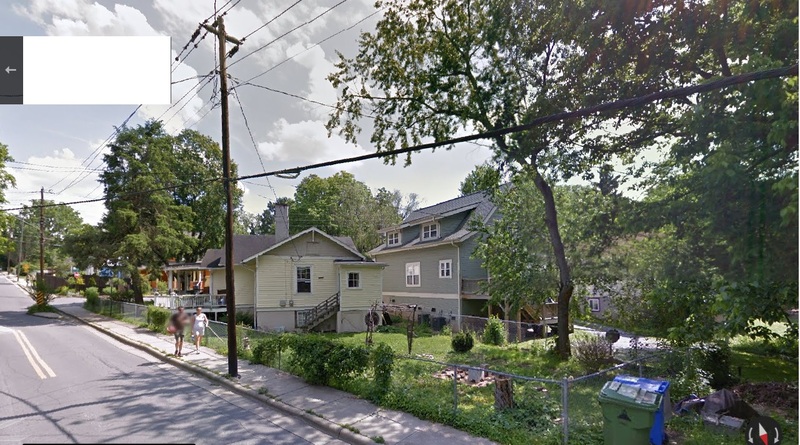 I’m very tempted to call one of Ashville’s as yet un-mystified neighborhoods Pineapple. A logical choice would be the neighborhood where I saw the UFO in the early 90’s. The apartment I was staying in lies only a couple of city blocks south of the now central Cherry-Lime, a fully mystified name. 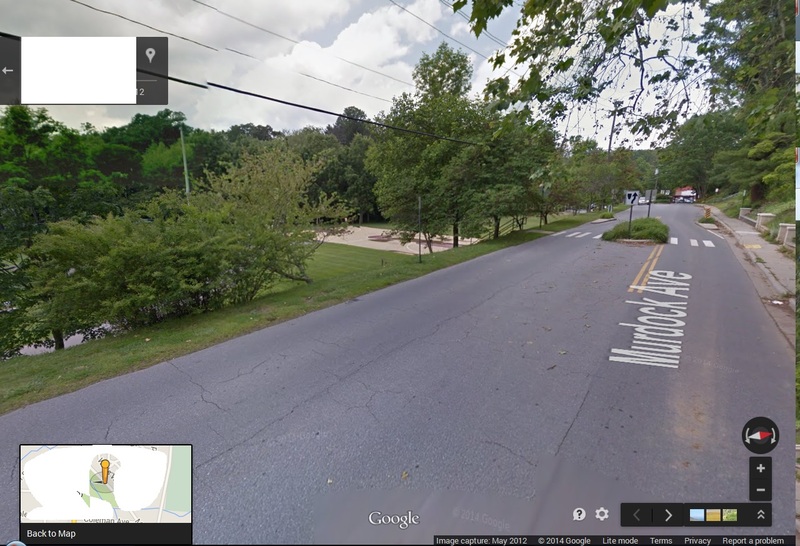 I’m also thinking that there was a town within the town, perhaps a toy avatar town or other type of “alien” avatar, existing just north of the mouth of Linden Creek, and on land now called either Read Park or Read Creek Park or Earl Weaver Park that’s the northern half of a determined two-part Google Maps Street View art event. 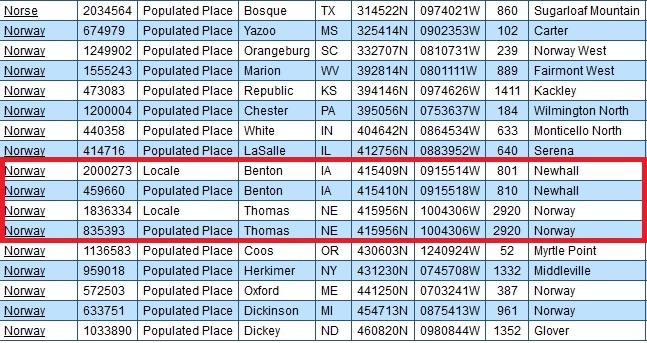 I’m thinking the name of this community might be Orchard or Orchard City, like the conglomerate town in Colorado we’ve briefly touched upon before made up of Austin, Cory, and Eckert moving south to north. A(B)C(D)E, then. The first letter (of four) of TILE (“I”). There was no noise that I recall. Two worlds; oblivious to the “danger” (far future humans?). 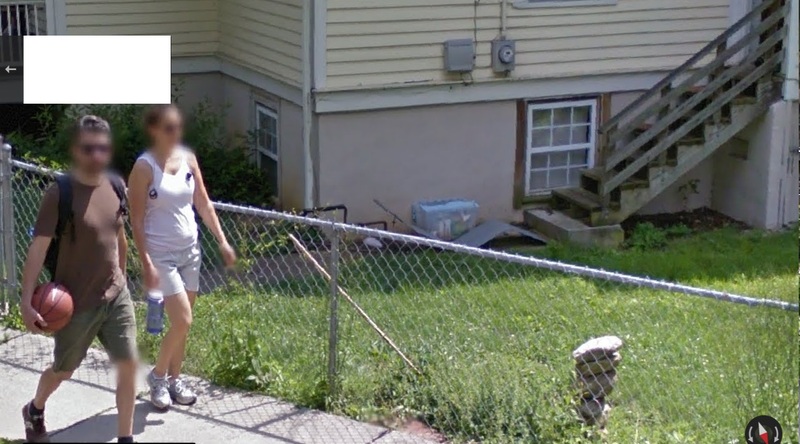 This one’s from Google Earth. You can just make out one of the southern traffic islands down the road, I believe. 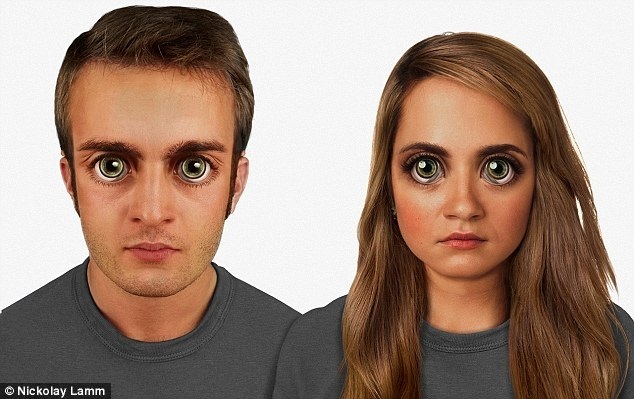 I might call this creature Saucer Eyes, or just Saucer or Saucey for short. See below for similar flags (!). 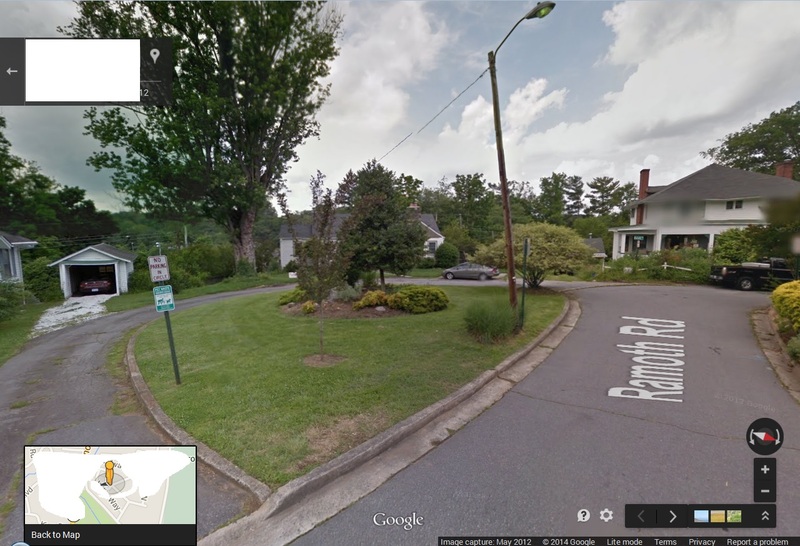 It was a cool and overcast day yesterday when I decided to head to Ashville to check out more recent Google Maps based oddities. Nothing earthshaking found, but I’m starting to fill in a larger picture. I continue to believe a lot of it, a lot of what the energy is channeled through, has to do with that stream I call Linden Creek running between Cherry and Lime streets. 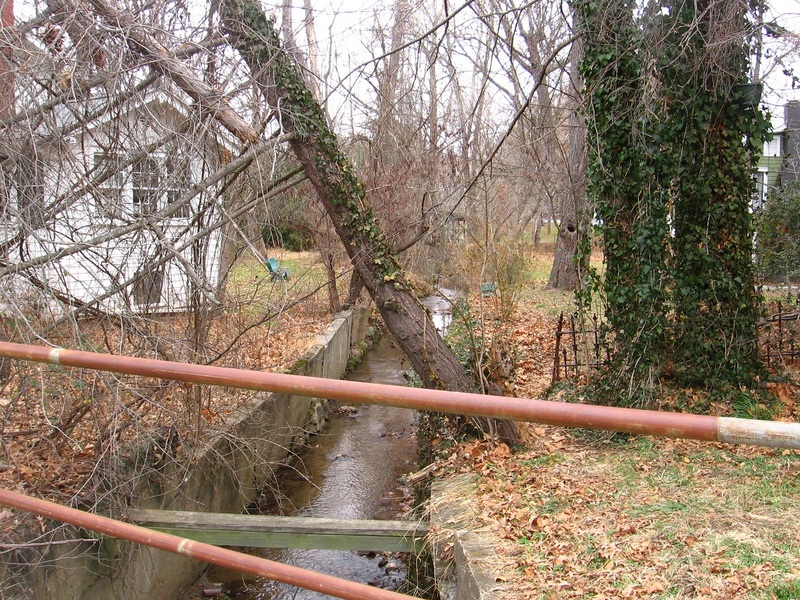 Below we have a conjunction of Linden Creek (top) with Read Creek (left) at the southern edge of Earl Weaver Park. As I’ve stated before, the 2 flows are about equal here, perhaps opening a debate over which creek name should have yielded to which. Read Creek won out in this reality. In another it may have been a different outcome. 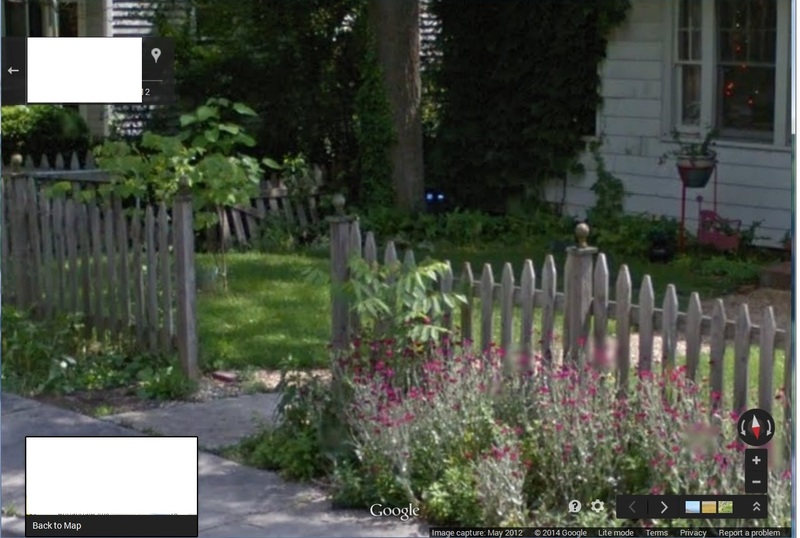 Bamboo and fence bordering Cherry Ave. not far from Linden’s mouth. 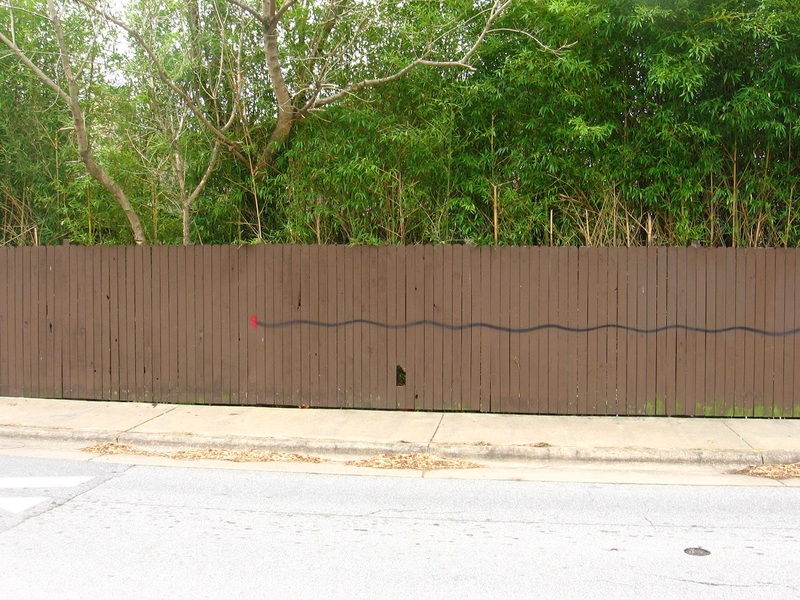 A perhaps peculiar design has been painted on the fence. Is is a map of the stream existing not far behind it. Do the joined red spots to the left indicate a mouth for the stream creature? Do the 2 dots indicate 2 different choices that the name of the combined stream could take, even? Things to be asking. 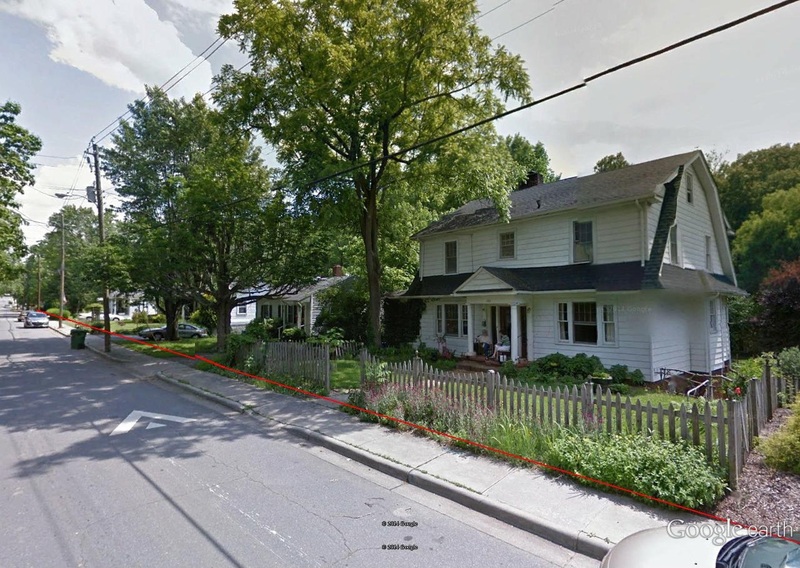 Linden Creek from Banana Street, just as it passes the house formerly (presently?) inhabited by Ingleboort and Flaarph’s friends George and Harriet. 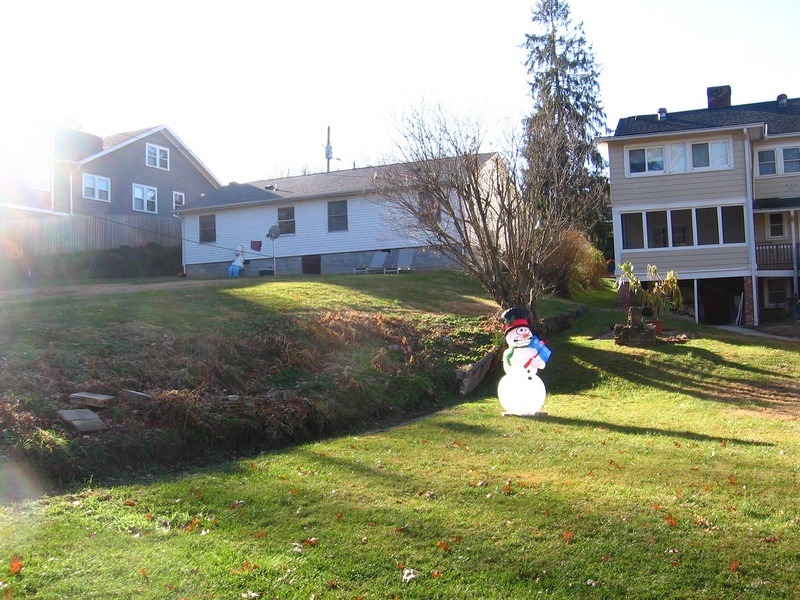 Another strange thing about this house I found out yesterday: a hiding fence has been erected all along its north and back side, and a cement patio has been built right next to the creek to the north. 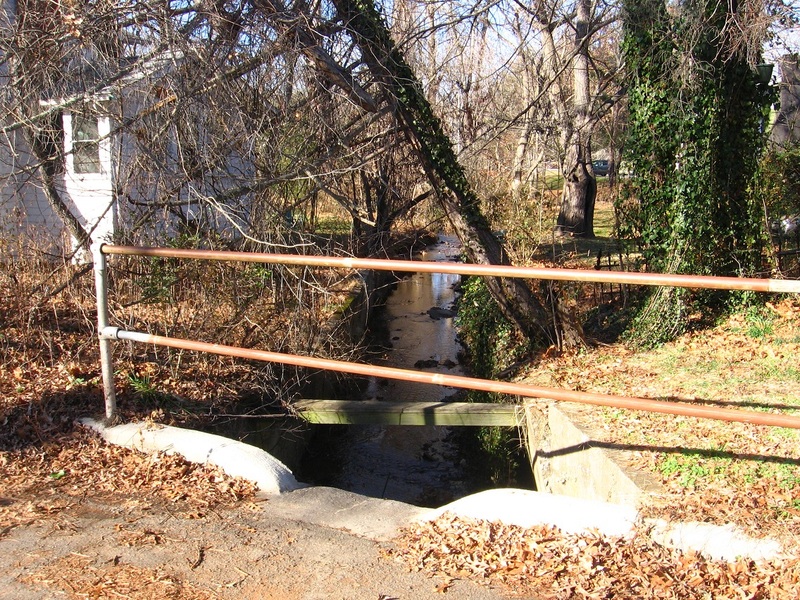 Is this where G and H commune with the creek and learn more of its secrets? Is this where I and F first appeared to them? 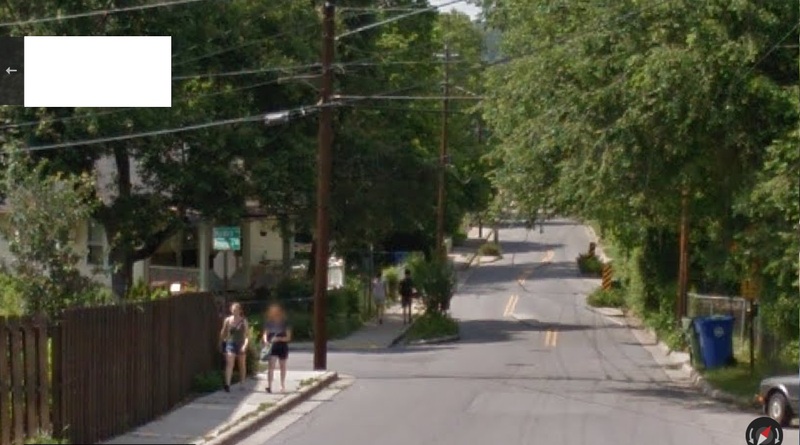 Did I and F at some point tell them they should pose for Google Earth Street View when the camera topped car drove by at a specific time in May 2012? “Sit on the porch just like this,” they might have said, perhaps telepathically. “We’ll sit in the yard just below you.” “It should look like we are 2 sets of twins, one mirroring the other,” they might have additionally thought only to themselves. And so it came to pass. Colors of TILE on Lime Street not far from George and Harriet’s once more. Perhaps the site of a TILE Temple in the past, Linden Creek style. A past marker as it were. Linden Creek looking in the other direction away from G and H’s on Banana Street, or toward its juncture with Read Creek only about 30 yards distant from here. More interesting bamboo enclosed house on Cherry Avenue. I believe there’s a good chance the inhabitants know the secret of Linden Creek as well and the power it holds. At least 5 of the 7 dwarves from Snow White pose beside rocks in front of this house. I’m not sure what they have to do with the Linden Creek avatars like I and F, but perhaps something (!). And there’s another Japanese torii fronting the place; could be a secret totem indicating knowledge of the creek’s power for others in the know to see and understand. Maybe they even have meet-ups(?). And perhaps that colorful flag bunting is another secret indicator of wisdom. 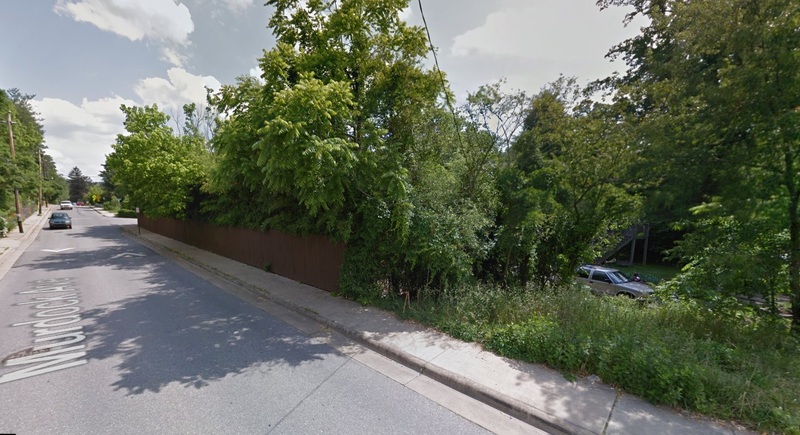 Further upstream, we catch a good glimpse of Linden Creek through a fence on [fill in the blank] street. I was quite surprised how large the creek is here. No tiny affair we’re dealing with. Cherry Avenue’s southern set of traffic isles, once more. Said to, “look like something you’d find in a pinball machine” by one critic. Bamboo bordering Linden Creek or marking its flow appears in ample amounts behind Cherry Avenue and Lime Street houses. 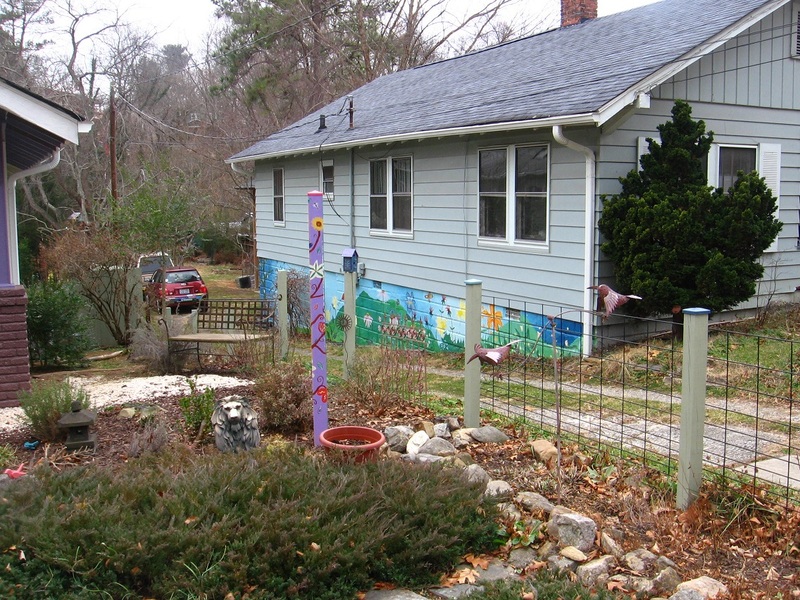 Still on Cherry Avenue: interesting house mural. 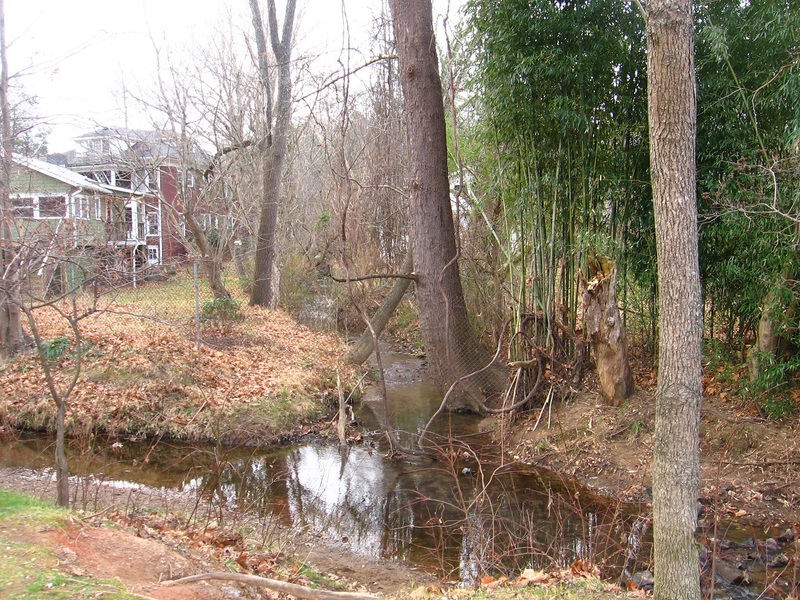 Again I must ask: does it secretly tell the story of the creek’s native inhabitants? I’ll have to get a better picture of the mural soon. 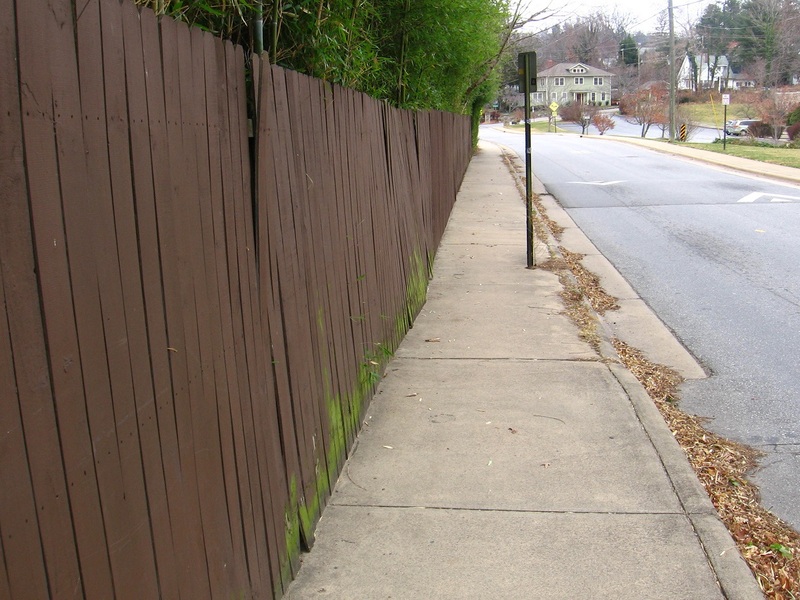 Bamboo backed fence again, looking toward the Norwegian Wood neighborhood. Although I visited the latter as well this day, I didn’t snap any pictures. Again: rectification soon enough! Ashville is not that far away. One of the roots of the annual event now known as Burning Man began as a bonfire ritual on the summer solstice in 1986 when Larry Harvey, Jerry James, and a few friends met on Baker Beach in San Francisco and burned a 9-foot (2.7-meter) wooden man as well as a smaller wooden dog. Harvey has described his inspiration for burning these effigies as a spontaneous act of “radical self-expression”. …. In 1987, the effigy grew to almost 15 feet (4.6 meters) tall, and by 1988, it had grown to around 40 feet (12 meters). Burning Man attendees informally called it “The Man,” and this name was given to each successive effigy, every year since Burning Man began. Harvey stated that he did not see the movie The Wicker Man until many years later, so it played no part in his inspiration. Cherry Island = (residence of) man. Dog Island = (residence of) dog. Dog was forgotten about or submerged in time (after 1986 apparently). Man remained, sans smaller companion. Burning Man is bourne. Burning Man is also a primary inspiration for Linden Labs’ Second Life, also in San Francisco like Baker Beach. 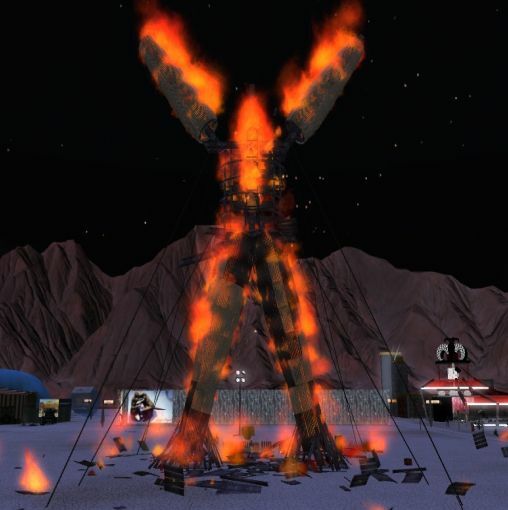 An inworld event called Burn2 (originally Burning Life) has virtually attempted to recreate the excitement of Real Life’s Burning Man since 2003. A pivotal year was 1996. Burning Man could become Woodstock or Altamont. The safer route was picked, which was inevitable. Else the whole event would be nuked. Presently, Second Life still isn’t very accessible – most people still don’t have the time to get over the steep learning curve and get to the amazing stuff inside. Similarly, the total number of people willing to drive 3 hours from Reno into the middle of a barren desert carrying a week’s worth of drinking water and food is limited. Try not to cling too tightly to what we have now. The design, the UI, the orientation experience, the tools – all these need to change, a LOT, for Second Life to become accessible to hundreds of millions. Those changes are sometimes going to be disruptive and painful… But a bigger part of my heart wants to see it reach everyone, and so we must evolve.